Top 10 Cooling Summer Recipes – Healthy, Plant-based, Delicious! Here’s some of our favourite recipes to go with this heatwave. We spend plenty of time in tropical and steamy places, so we know how to keep things cool when the thermometer starts to rocket. There are even rumours right now of people in North Wales wearing shorts! Focusing on cooling ingredients, especially things like cucumber and watermelon for example, will help keep you chilled. Also, hot drinks. Sip some tea like the desert bedouins do, they know it works! Although a nice long drink, with ice and all the trimmings is the perfect treat. Try freezing fruits like watermelon, any melon actually, berries, mango, pineapple etc and simply blend them. Very refreshing, the healthiest slush puppy you’ll ever try! Also, you can freeze fruit like gooseberries and pop them in a drink, fruit ice cubes. We also love juicing vegetables and fruits and pouring it into an ice cube tray, or even better, lollipop moulds. Just add sticks (cocktail sticks are fine for the ice cube tray) and you’ve got gorgeous, healthy coolers waiting for you in the freezer. Try freezing one layer of juice first, then adding another, and another, until you get a very cool rainbow effect. Looks amazing! 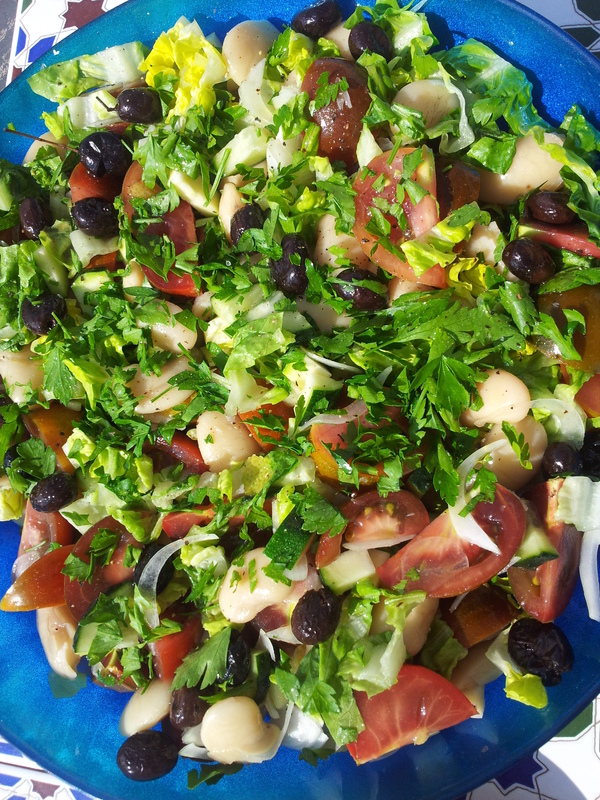 This is the perfect salad for a sweltering day. Use whatever mix of veggies you like here, its the dressing that’s the superstar! The perfect centre piece for a summer ploughmans or salad platter, of course, goes amazingly well with basil and ripe tomatoes. Very chilled, very simple. Plus, lots of vibrant colours and flavours. I love chargrilling or barbecuing figs at this time of year. Perfect! A taste of Thailand. Light, but packed with nutrition, ideal at this time of year. When eaten not long out of the freezer, these mini cheesecakes are cooling and so delicious. Our favourite choc ices, a must try and sugar free! This recipe comes all the way from India, Tamil Nadu, where it reaches nearly 50oC in the summer. 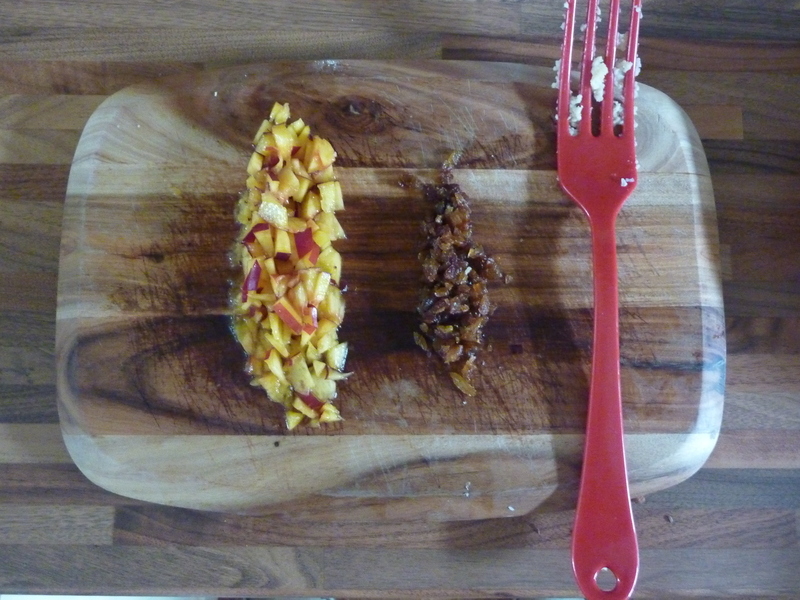 Coconut + Mango can only = one thing. YUM! If you like these recipes, please feel free to comment below and share with friends and curious cooks! Join our private plant-based cooking group here, for exclusive recipes, updates and meet like minded people, share pictures and generally celebrate and get inspired by awesome vegan food and a healthy lifestyle. This is a salad for all those who can’t say goodbye to summer just yet! Figs seem all of a sudden plentiful in the UK. I’m seeing them in most shops I go to. 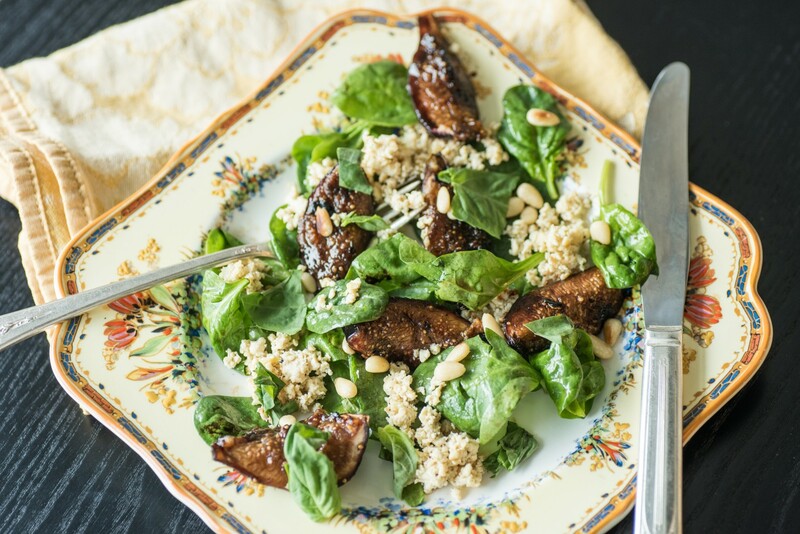 I love cooking figs, so sweet and fragrant, and I can think of a few nice things to do with them, but charring them slightly and serving them with a crispy and lively salad is one of my favourites. This is an original recipe from Peace & Parsnips, I rarely cook recipes from the past, I’m too busy creating new ones normally, but this is a winner and I really like the tofu feta and flavour combos. I normally make tofu feta by simply crushing the drained firm tofu with herbs and other flavourings, but cooking it briefly in a pan here intensifies the flavours even more. I’m very happy when eating figs, but must admit, most of the year only eat them dried. I love the way they can be incorporated into traditionally savoury dishes like salads and they are perfect when mixed with a little spice and wholegrains. 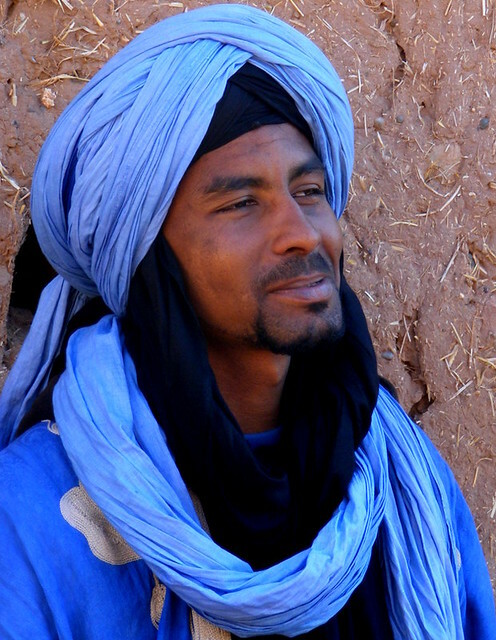 I remember in Morocco living off figs for a few days in the mountains (which was not a great idea, they are full of oxalates), as a veggie back then, there was not a great deal to eat and I was really rural, up in the Atlas mountains hiking with some Berber musicians. I bought figs on long ropes, big fig snakes, that I kept hanging from my backpack. Whenever I needed a nibble, I just plucked one off the rope. It was a great snack. Experiences like that make me a little sentimental about some foods and figs do bring back loads of good memories. Still, this is quite a long way from this dish which was influenced by my times picking grapes and travelling through France. One of the stand out dishes of that time was a meal prepared in the Loire region, a salad with charred figs that I’ll always remember. I felt so grateful that the chef prepared a special dish just for me. Most of you know that Jane and I can normally be found tucked away somewhere in Snowdonia, or travelling the less beaten path somewhere in the world, but this recipe found its way over to the food section of the Washington Post! It’s incredible to see the food that we are passionate about in the Beach House in newspapers and blogs around the world. So this is a very healthy twist on a traditional feta salad that can be bulked out by adding more toasted nuts (cobnuts would be perfect!) and maybe some white beans would be nice, even mix in something like orzo or oven baked polenta…..ok, I’m getting carried away now! It’s ideal for an autumn lunch, as we’re just hanging onto the sunshine and warmth in the UK and getting ready for the big, sustaining stews and soups of winter. I say, get in the fresh figs while you can! As we all know, figs are precious! They are delicate and should always be handled and stored with care. Give them a gentle squeeze when you buy them to check that they’re not too soft. Figs are best washed just before you use them, because they can be so delicate, it’s best to cut them with a sharp knife. Eat them within a few days of purchasing. If you don’t have a griddle pan for the figs, a nice frying pan will do the trick. To make the tofu feta, put the nutritional yeast flakes into a bowl with the lemon juice and zest and leave to dissolve. Heat the oil in a small frying pan on a medium heat and add the tofu and garlic. Pan-fry until slightly golden, then add the lemon mix, salt and pepper, bring to the boil and cook until the lemon juice has evaporated. Spoon into a bowl and allow to cool. Check that it’s just a little too salty, like feta. To make the dressing, whisk together the lemon juice, syrup, vinegar, salt and extra virgin olive oil in a small bowl. Mix the rocket and basil leaves together in a bowl. Drizzle 1 tablespoon of the dressing over the leaves and toss together. Keep the rest of the dressing for further dipping and drizzling. Warm a griddle pan on a high heat and brush with a little oil. Just as the oil begins to smoke, place your figs widthways in the pan. Allow to cook for 2 minutes, basting them with balsamic vinegar as you go.Turn them when well caramelized, then remove the now sticky figs from the heat. Scatter the leaves beautifully on plates, and top with the warm figs, a couple of spoons of the tofu feta and a sprinkling of toasted pine nuts. Apparently figs are one of the worlds oldest trees. They are high in minerals like calcium, magnesium and iron and are a great source of anti-oxidants like vitamin A, E and K. They also have a lot of fibre. Complete carrot transformation. If you’re having a plant-based BBQ, slap these on. It is impossible to not like them. No one will believe what you’ve done to a humble carrot. You made it into a delicious, smoky not dog!! They will look upon you as some kind of food magician. It’s a good look. Go buy a cape. 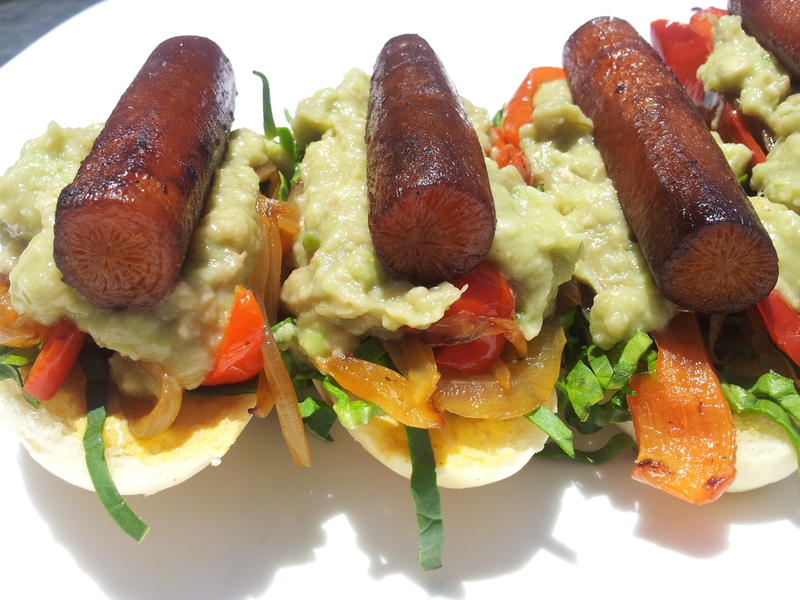 A super tasty, healthy, plant-based option to that ‘classic’ hot dog thing, given a Spanish style twist here. Pinchos (mini open sandwiches) are the perfect sandwich for this time of year, light and packed with flavours. I also like the name. The Spanish know their way around a sandwich thats for sure. Pinchos just look amazing when placed together on a platter, especially when mixed up like a sandwich collage. They are way too enticing to walk by. If you’ve been to Spain, one of those big and buzzing tapas bars, you’ll know what I mean. In old town San Sebastien especially, there are some beautiful arrays of pinchos covering every nook and cranny of the bars. You can probably tell by the radiant sunshine that this was not a UK post. Although Durham is looking very summery from where I’m sat. I cooked it on the Costa Calida in Spain. 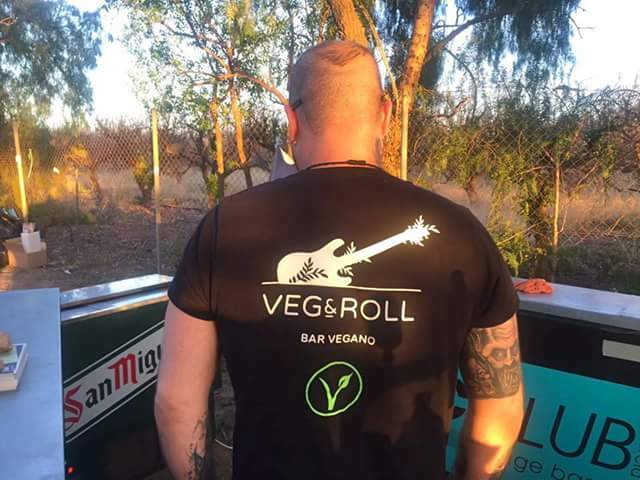 Jane was there recently and attended a vegan festival, small but perfectly formed, this is something brilliant for Murcia. 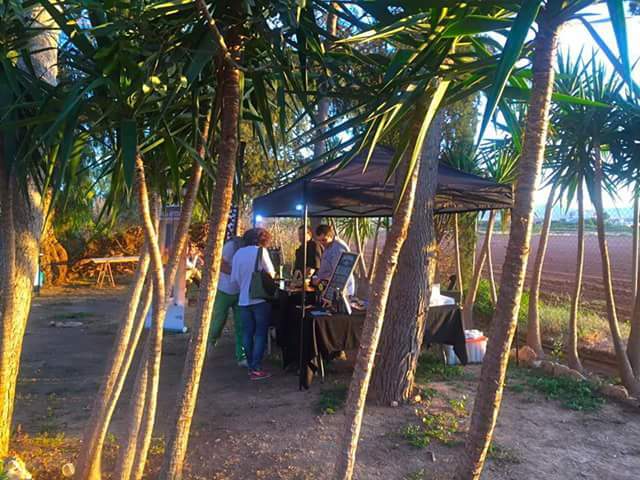 There were a load of food stalls, live music and plenty of organic local products. Even artisan beer (the most popular stand). Apparently Jane and friends were the last to leave. The artisan beer was just too good. Murcia, like the rest of Spain, its a highly fishy/ meaty place and there is a growing vegan community and awareness. Of course, in Barcelona and Madrid, you can find some vegan options, but I still think Spain is one of the toughest countries to be a vegan traveller. Murcia has always been a little forgotten corner of Spain and poor, therefore, there are some interesting recipes with only veggies. People couldn’t afford meat, so they made veggies delicious and you can occasionally find these dishes in restaurants, but generally, they are cooked in peoples homes. I love one dish in particular, Morcilla de Verano – here’s our recipe. 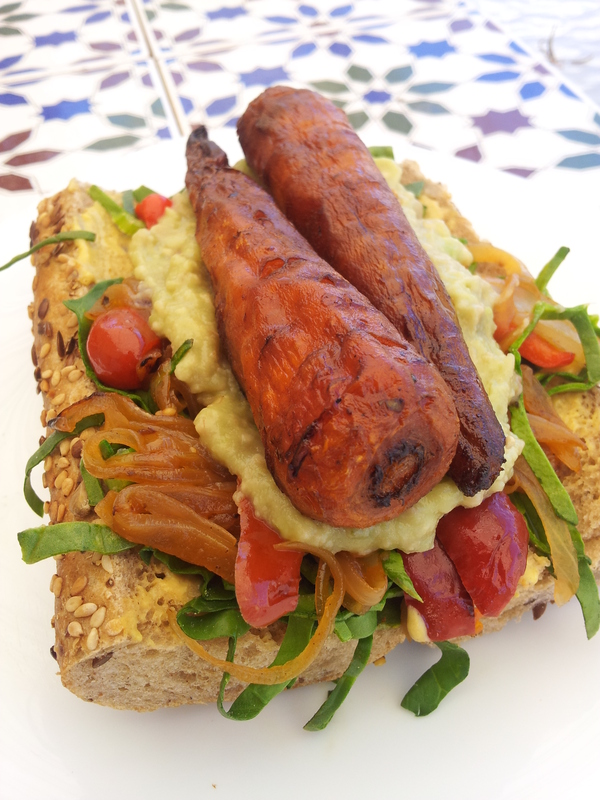 Its a vegan take on the famous Spanish ‘Morcilla’ sausage and everyone loves it. Even proper jamon heads. I was orginally asked to write this recipe for Shape magazine in the US. I know it seems strange that I’m doing things for massive lifestyle mags like that, it does to me anyway. If you’ve followed the BHK for a while, you’ll know that we’ve gone from the growing cabbages and herbs in the middle of nowhere, half way up a hill in North Wales, to the pages of swanky magazines. I even fed Beyonce once in an article!! Hahahahaa! Last year I was in Hello and other mags that I’d never have imagined in my weirdest dreams that I’d end up in. When I was younger I probably imagined I’d be plastered all over The Rolling Stone, maybe Mojo or the NME (of the 90’s) in a rock star delusion. Life is just one big strange surprise really!! And yes, some of my friends think its cool, but most just laugh at me. Often. I used to be more Johnny Rotten than Beyonce, but maybe time mellows things out a bit. I don’t care either way, getting tasty vegan food out there is amazing! I’d love to cook for Beyonce, Morrissey, Philip Schofield, whoever. In fact, if we invited Johnny Rotten that could make for an interesting dinner party. Shape didn’t quite go for the ‘pincho’ thing and instead called them Carrot Not-Dogs, which is cool by me. This kind of thing has been around for years in vegan-ville and it’s awesome to see dishes like this getting out there. You cannot, not, ever, not like, not-dogs! Kids go wild for them!! Ideal for summer light lunches or even bbqs (instead of cooking in a pan, pop them on a BBQ and baste with the marinade). I’ve popped two methods below, one for a quick roast, and the other, the works; marinaded overnight and pan fried. Both are delicious, but the marinaded dogs are smokier and look more like the real thing! I like the way they look when un-whittled down. Just a straight up carrot. You can’t pass them off as a hot dog, but who really cares about that?! For the marinade. If you can’t track down liquid smoke, don’t fret, we can use some smoked paprika. A few large pinches will do. Ripe avocados are best. I couldn’t get any and was asked to do the recipe at short notice. You can see that the aioli is not totally smooth. It’s so much better when silky smooth. 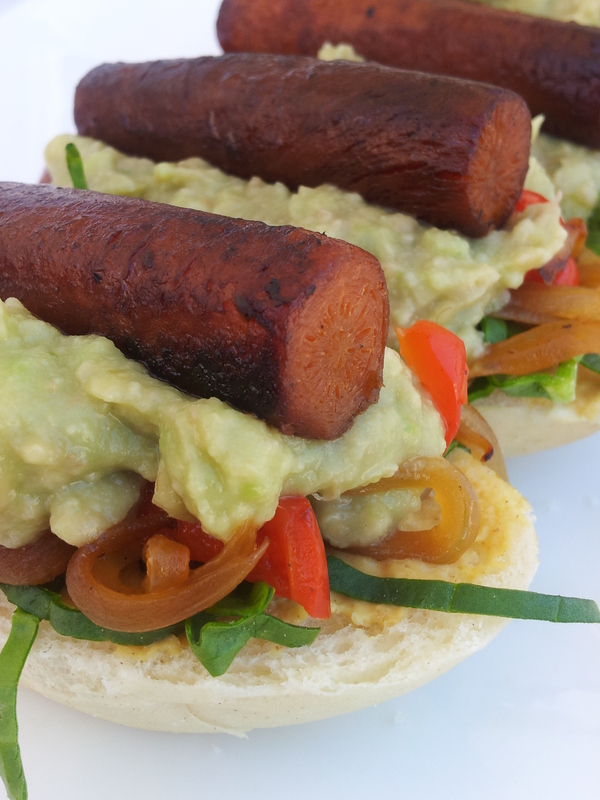 You can quite happily serve these carrot not-dogs with just the avocado aioli or even just a bit of mustard. A nice idea is wrapping them in a blanched collard/ spring cabbage, kale leaf or even raw lettuce. A great gluten-free, mega healthy option. Half fill a small saucepan with water, bring to a rolling boil and add the carrots. Simmer for 8 – 10 minutes, until a knife pierces them easily, but they are not too soft. Place in chilled water to cool quickly. Whisk together your marinade ingredients and pour over the cool carrots. Cover and place in a fridge over night. In a frying pan on a medium high, add 1 teas cooking oil and when warm, add your onions. Fry for 7 minutes, add the peppers, fry for another 5 minutes, until the onions have turned golden brown and sweet and the peppers are soft. Set aside. Drain your carrots, keep the marinade. Wash out the frying pan and add 1 teas cooking oil, place on a medium high heat and add your carrots. Fry for around 10 minutes, drizzle over marinade regularly and keeping them turning in the pan. This will give them a nice caramelised look all over. Put your avocado, lemon juice and salt in a bowl and mash with a fork until smooth. Alternatively, pop them in a blender and blitz. Spread a thin layer of dijon mustard on your buns, sprinkle over some spinach, followed by some onions and peppers, a spoonful of avocado and top with a smoky carrot. Preheat an oven to 220oC. Make half of the marinade recipe. Toss your carrots (whole, these look great just carrot shaped) in 2 teas cooking oil and a large pinch salt. Place in the oven on a baking tray and roast for 45-55 minutes, until tender and nicely caramelised. After 25 minutes in the oven, baste the carrots with marinade regularly. Carrots are filled with beta-carotene or Vitamin A. Which helps us see in the dark. That’s what we’re told anyway. This myth came from WWII when the Brits spread propoganda, apparently to confuse their adversaries. The Ministry of Food (hello George Orwell) even created a cartoon called ‘Dr Carrot’, with sidekicks Caroty George and Clara Carrot (actually made by Disney), to get kids eating more carrots. In WWII sugar was rationed in Britain at that time and carrots were sometimes served on sticks to kids as a sweet substitute and used regularly to sweeten desserts. So you won’t get night vision any time soon, but your eye sight will be helped if you eat plenty of Vitamin A. Music to cook pinchos by………. 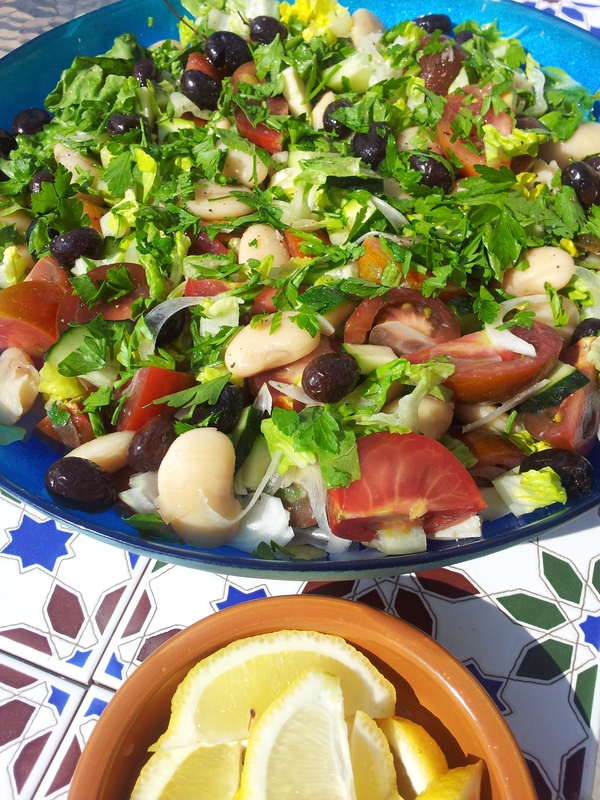 Butter Bean, Lemon and Black Olive Salad – A Real Taste of Murcia! 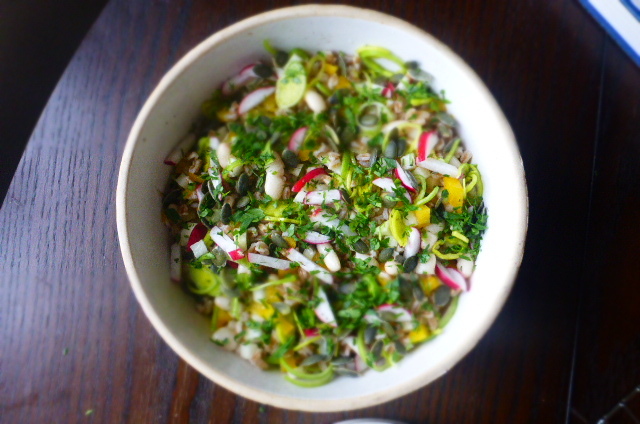 A simple sunshine salad which makes a great quick summertime lunch. Ideal served as a side or starter, add some chunky croutons or toasted nuts for a more substantial dish. The sun is coming and with it comes sprouting a host of beautiful fruits and vegetables. Summer is an exciting time of year, we can finally don shorts again and be collectively surprised at how white our feet are! The flip flops are out in force, maybe a vest and we’re into the garden with salads and fizzy glasses. Certainly in Spain, salads are an every day delight. There is a global constant that baffles me. You visit local markets and shops (this does not apply to the sub-Saharan region) and there are a wonderful selection of fruits and veggies displayed. You then go to the restaurant next door to find that none of the lovely local fruits and veggies are present on the menu. It’s a strange old situation. The world is addicted to potatoes and tomatoes it seems. 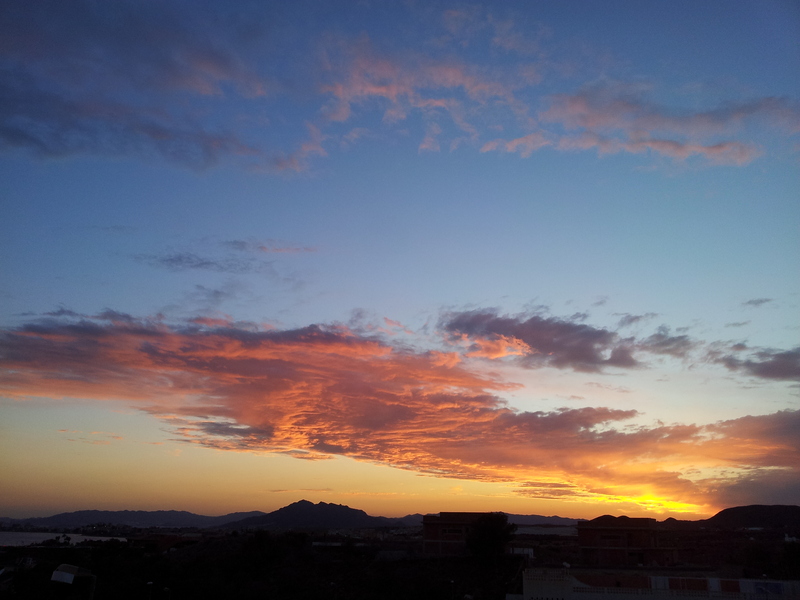 Murcia is similar. 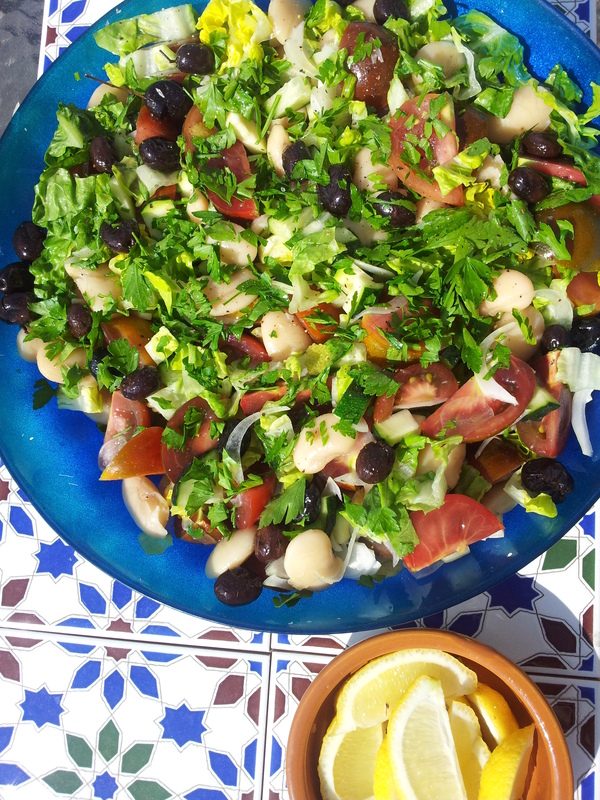 Although this is the ‘garden’ of Spain, and possibly Europe, a Murcian salad consists of onion, tomato and some black olives (plus tinned tuna if you’re particularly unlucky). This is my version of the local salad using things we can all get our hands on. 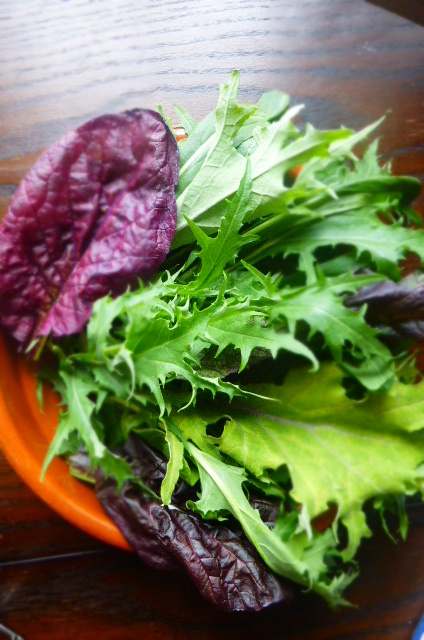 You can’t just throw things into your finest salad bowl and expect magical results, salads need a little thought. There’s a balance there. I’d say always gently handle and chop your ingredients and toss them together with care. You want a nice combo of flavours and textures, without over doing it. 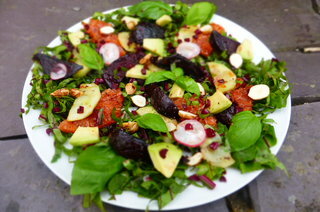 Salads are our chance to showcase amazing produce and whenever possible, lets buy good stuff for our salads. 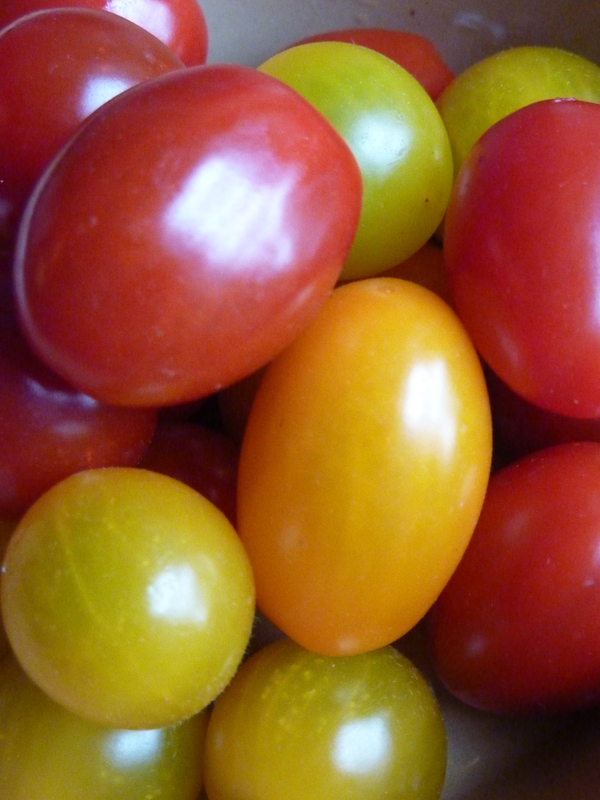 You might be able to hide vacuous tomatoes in a stew, but in a salad, they just look so lame. I’ve just been down to the local Sunday market here in Mazarron and beeeee jeehzus there is a startling array of amazing produce at the minute. 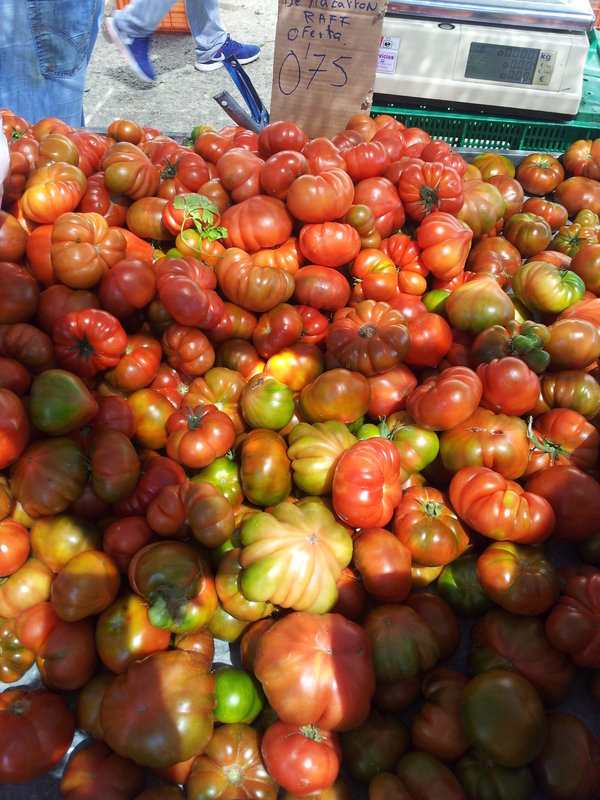 Piled up like technicolour forts; melons like beachballs, bewildering varieities of tomato action, gangs of crimson peppers so deep and vivid, every conceivable shade of olive and crispy, fresh donuts (churros). Well, they seem to balance up all the healthy veggie behaviour. Spain is hot in weather and generally, super chilled in attitude. My kind of combo. 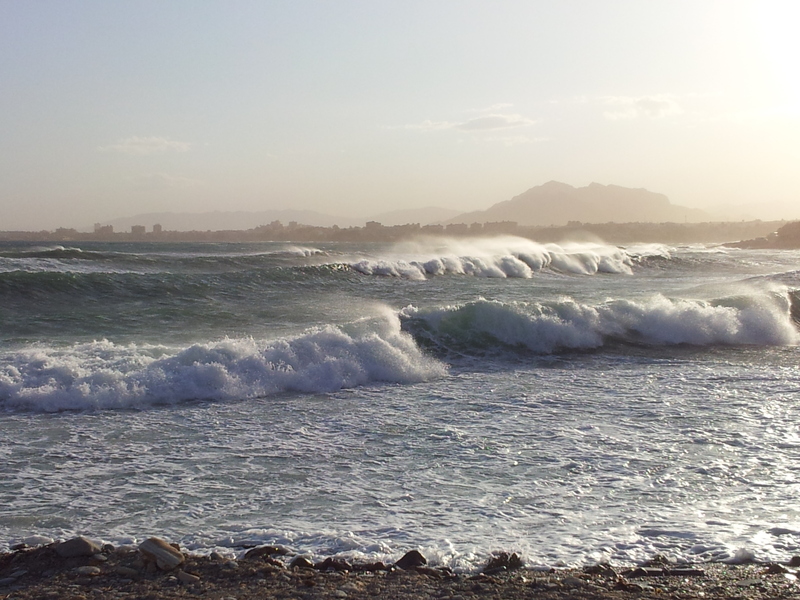 ‘Manana!’ (tomorrow) is the Murcian moto. Their crest is probably a tranquil terrace scene, but I can’t verify that. 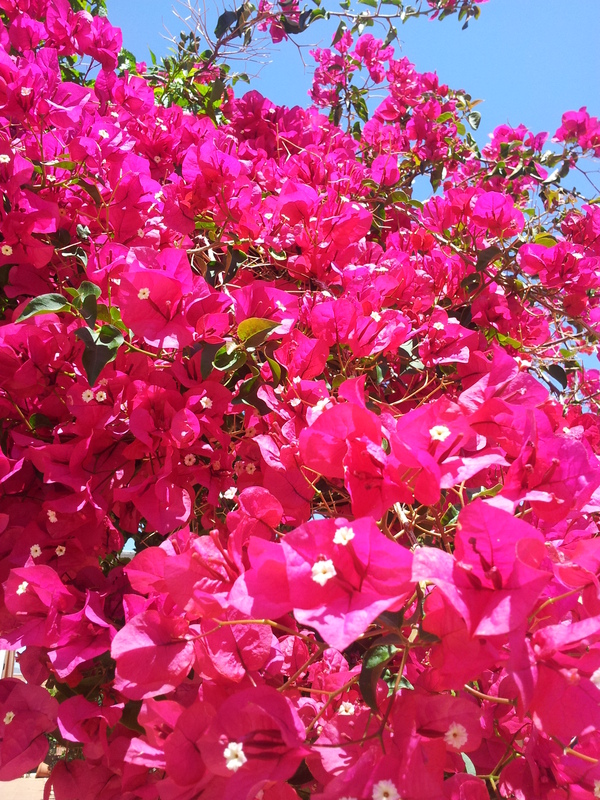 Today is for enjoying….. I rock up mid-morning just after the donut breakfast feast that’s washed down with goblets of brandy or thick coffee (maybe beer) sometimes a combination of them all will lashing of condensed milk and randomly, nutmeg. It’s a coffee called an Asiatico and is more like several desserts in a small glass swimming in a few shots of black espresso. If you’re lucky, you can score a fresh orange juice, but expect at least two funny looks as you make your way back to a wobbly plastic chair in the sun. Sunday is a good day here. There is a whole host of other items sold at the market; counterfeit cd’s, plants, leggings, trees and the occasional pot or pan or pot plant. There is also a very cool pan pipe band from Peru who belt out all the classics. I must say, I just focus on edibles. I have a routine, I sweep past with an empty backpack, the first pass. I am above temptation. I don’t buy anything. This is a strict regime, fact finding, and essential for quality control and price comparison. There is no Asda price in Murcia, you’ve got to do the leg work and have hawk like instincts. Bargains are fleeting and sometimes well disguised. I asses the form and then stop for a well earned cafe americano (sometimes plus a few crispy donuts). If I don’t have donuts, the lady will feel sorry for me and give me some anyway. Older ones from the bottom of the pile. A donut constant that I go with. Then the fun begins. I have pockets of small change and throw myself into the crowds of haggling Spanish and Moroccan housewives, all at least half my size and double my strength, who posses pin sharp elbows. Dead legs and worse have been known around the olive stand and especially at the bargain tomato family and always at the toothless apple dude. The olive stand is a piece of work, ran by three generations of a family. It seems they’ll pickle or preserve anything going. Capers, caperberries, garlic, cucumbers, pink pickled onions the size of a cricket ball, the olives are pretty hot too. You’ll always get a few freebie tasters if you offer equally confused and intrigued expressions. Have you tried a purple olive? I went for some bitter bright green local olives today, they love their bitter olives in these parts, stuffed with lemon rind, minced onion and rosemary. Quite a thing I can assure you. I know each stand intimately by now, after ten years, I’m one of the villages most well schooled veg selector. They all have their stregths and weaknesses and I try to spread the wealth (amounting to a few euros) around. I’d say on average, the fruit and veg here is at least 1/3 price in a UK supermarket. The Spanish supermarkets also charge more than Mazarron market. The market shifts from town to town, four days a week, I’ve been to each location but the Sunday one is the best. 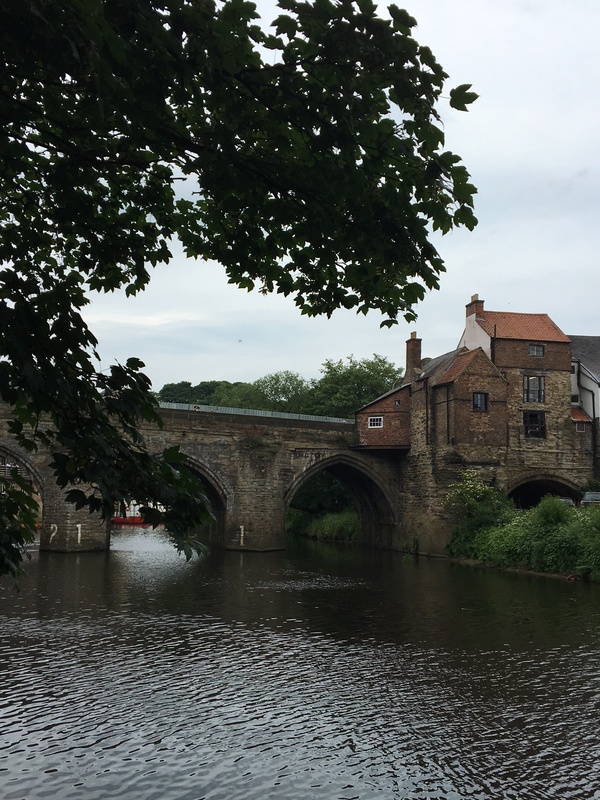 People are letting there hair down and there is a sense of celebration, most of the stall owners clutch a cold can of beer, churches occasionally ring bells and you’re never far from a chuckle or guffaw. It’s a tough old life in Spain guys!! I’ll keep the sunny plant-based correspondence flowing. Here’s what I did with todays haul. For a more filling salad, drizzle some bread with olive oil and toast under a grill. Roughly chop up and toss in a little more oil, a pinch of salt and a few pinches of dried herbs like oregano and thyme. Scatter over the salad before serving. Pickled garlic is not that easy to find but it is a superstar ingredient. Use a couple of cloves of fresh garlic instead, it’s worth noting that the flavour is different, pickled garlic is sweet and mild tasting pretty well pickled! I find it quite addictive and sometimes just eat it straight up, I find its quite nice served with nibbles. I find the lemon and a good extra virgin olive oil is more than enough dressing wise. Spain boasts very fat and creamy butter beans. Seek out some beauties for this salad, they are one of the highlights. Using pitted olives is a good idea. An unexpected olive stone is always an unwanted crunch. Place all ingredients in a large salad bowl, drizzle with a little olive oil and the juice and zest of one lemon. Toss gently together with your hands. Scatter over the parsley, some salt and pepper and croutons if your using them. 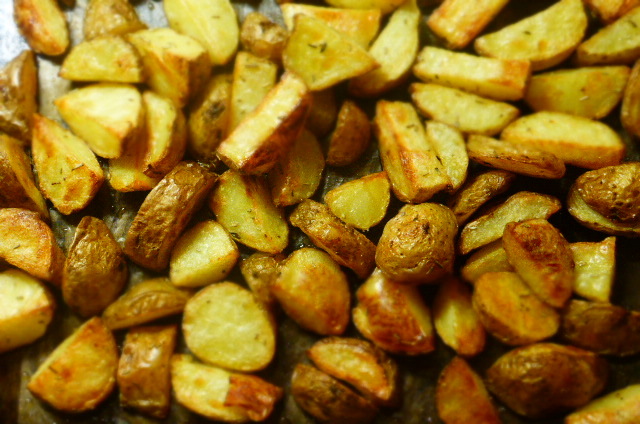 Serve with more wedges of lemon if you fancy a little more zing and extra virgin olive oil for drizzling. I had a great time on BBC Radio Wales recently, a little thing they do called ‘Foodie Friday’. It was the wonderful Eleri Sion show (although Tom was standing in) and we mainly talked about how accessible and incredible a vegan lifestyle is and coconut scones, but I did mention one of my very favourite dishes at the moment, a simple and really nutritious vegan frittata. Plant power for all!! I just had to share the recipe. Tom mentioned that vegan food can be more time consuming to cook than a lump of meat with vegetables, which may well be true for some dishes, but this frittata is so easy and straightforward and as with all vegan cooking, substitutions can be made, things can be swapped, veggies played with, happiness unearthed, taste buds dance a merry jig. It’s always easier when you’re done it, so lets do it! 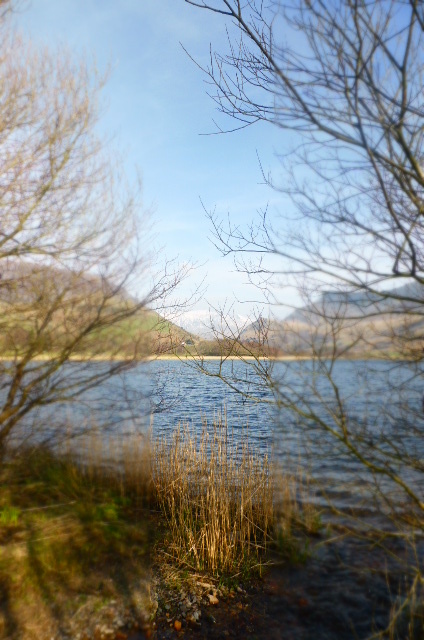 Spring is taking its gentle hold on North Wales and the nights are lighter and the sun is making reappearance after a long winter. Its such a beautiful time of year and we are naturally turning to lighter foods. This frittata is a brilliant way to use up gorgeous roasted vegetables, either freshly roasted or leftovers. The other night, after some very posh curry and chips (see below), I pondered how to use the leftover potatoes. It’s been a while since our last Spain time and I know Jane loved Potato Tortillas so this was a no brainer. I know the art of romance, surprise frittata! 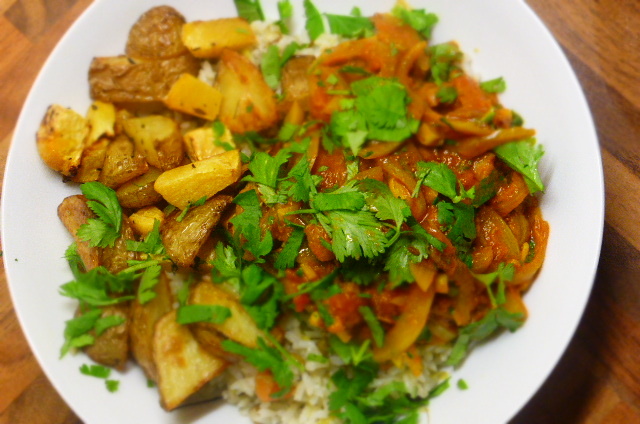 Posh chips and curry sauce – a Beach House classic made with local organic roasted potatoes and a spicy masala sauce (recipe from Peace & Parsnips) Yumah! A tortilla is basically a Spanish name for an unfolded omelette. Most people will cook this in a pan and then grill it (this is also called a ‘Frittata’ in Italy or even a ‘Kuku’ in Iran – confused yet?!) but I’ve made it easier, pop it in the oven and all is well. In fact, omellete’s seem to be a staple in most countries I visit, from North Africa to India, the world loves an omellete. Making it a vegan delight is quick and easy. I’ve cooked this for many non-vegans and they love it, a few glugs of olive oil for richness and no one misses those strange oval chicken things. 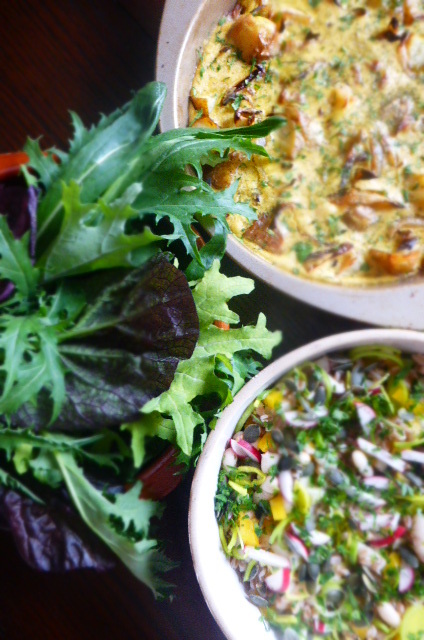 Frittata is very happy when paired with a grain salad and some green leaves. That’s lunch! I’ve made a little Farro and Canellini Bean Salad, packed with crunch and the wholesome feel of the farro, served with some top salad leaves from our local organic farm. When the leaves are this good, with amazing vitality, fresh flavour and texture, I just give them a quick rinse and tear them up with my hands. Finely slicing amazing salad leaves just seems like a waste. I love to see their shapes. I am constantly blown away by the diversity of flavours in the plant word and salad leaves, sprouts and cresses are a real joy for me. At the recent Discovering Vegan Cooking Retreat that we ran at Trigonos, we were privileged to try a load of different cress and leaves. The flavours were all over the shop, many shocking and delightful in equal measure; some subtle, some full-on. All suggested that in the near future, salads will be getting much, much more interesting. Trust me, you ain’t tried nothing like this! Crazy Cress! Such a diverse range of flavours and colours all wrapped up in tiny, tiny little leaves. Very interesting. Boom!! You can also use this gram flour mix for omelette’s cooked in a pan or as a filling for a vegan quiche or tart. A baked gram flour pancake in Italy is known as a Farinata and its one of the best things ever. 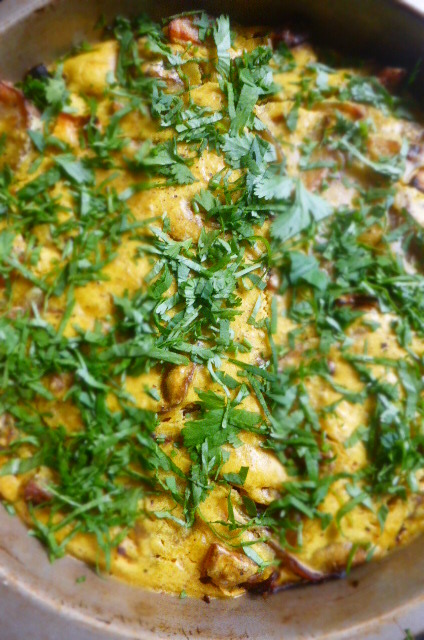 For a lighter frittata, why not add 1/3 teas baking powder to the gram flour and then stir in the water. Farro is basically Italian Spelt, meaning that some people who are gluten intolerant can handle it. If you are off gluten, try using buckwheat or even quinoa. Due to my intense love of veggies, this salad is light on grains. I like a high veg ratio in any dish. Very simple salad, torn leaves. No need to mess. Delicious! Grab a 10 inch non-stick baking dish, round looks good but you could always use a square one. If you are not sure about the non-stickiness of the dish, line it with baking parchment. Drizzle in a little oil, add the cumin seeds, onions and a couple of pinches of salt. Toss together and place in the oven. Roast for 15 minutes, stir, roast again for 10 minutes, stir, roast again for 10 minutes, by this time the onions should be nicely caramelised and golden. Set aside. While the onions are in the oven, in a large bowl, add the gram flour along with the turmeric, olive oil and a couple pinches of salt. Stir together and then gradually pour in the water whilst stirring, until a thick and smooth batter forms. Add your potatoes to the oven dish, mixing them in with the onions. Pour over the batter and sprinkle a little salt and pepper over the frittata. Pop in the oven and bake for 12-15 minutes, until the frittata is firm and getting nice and golden on top. Cut into slices and drizzle over a little more olive oil and a sprinkle of coriander/ parsley. A few toasted walnuts are also delicious. In a saucepan, bring roughly 1 litre water to a rolling boil, add the farro and simmer for 10-12 minutes. Until the grains are soft. Drain and refresh with cold water. Set aside. Once the grains have cooled, toss everything together in a big bowl. Serve with your favourite dressing and ideally, a nice big slab of frittata. My dressing for this was using pomegranate molasses, english mustard and sherry vinegar, with a light olive oil and a touch of salt and maple syrup. Worked nicely! Did you know that potatoes are a good source of protein, iron, fibre and vitamin C? I sometimes overlook how nutritious potatoes are. When buying gram flour, it may be called Besan (unroasted) or Chana (roasted) flour. They both have slightly different flavours. Chickpea flour has twice the amount of protein that wholewheat flour has and six times the amount of protein compared to white flour. It is also very high in folates and healthy unsaturated fats and is a good source of vitamin B6, iron and magnesium. We absolutely love Turkey and it’s diverse, veggie-friendly food. We have so many happy and tasty memories about our trip there a couple of years ago. We will be sharing more Turkish dishes soon as they are firmly on the menu at home and at work; Pide, Imam Bayildi, Shakshouka, Corba, outstanding salads, wicked coffee…….the highly delicious list goes on and on. 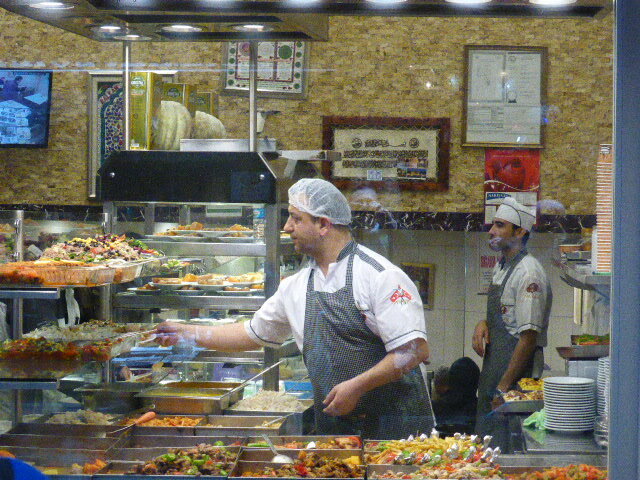 If you are vegan/veggie/ or just love amazing food, Turkey is calling to you! Three of my favourite things are travelling, eating and history (the order changes daily). Turkish is a feast on all these fronts. We did not eat Lahmacun in Turkey, it was always non-veg friendly, but I vowed to experiment with it when I returned home. Travelling inspires so many of the dishes I cook, influencing recipes, my constantly evolving style of cooking and the way I prepare food. I love wandering the world, soaking up all the flavours and techniques and then giving them a blast next time I’m in the BHK (or just any random kitchen for that matter). It is what inspires and challenges me to be a better cook and take on different influences. We travelled around the south of Turkey in a clapped out car, mainly camping, taking in some of the outstanding ancient sites and spending as much time bobbing around in the azure Med as possible. We then spent a couple of weeks working on an organic farm where we cooked with the local veggies, normally without electricity, power or water. It was a great challenge! At the end of meal times, we went across and fed the scraps to the giant resident wild boar. We bought produce from the local market in Burdur (Central Turkey, proper middle of nowhere. Beautiful people and landscape). The farm made its own rosewater, ran by a vet, enviromentalist and animal lover, they even cared for rare eagles, wild boar and wolves (yes, grey wolves! Normally injured by hunters). We especially loved the weekly trip to the markets and have never seen such a fine display of olives. Many stalls were like works of art, colourful patchwork quilts of olive perfection. Have you tried a pink olive?! One of our most random memories of Turkey was hitching a rid in a ramshackled sewerage wagon. We were stuck in the middle of the mountains and it was a lifesaver. Very fragrant. 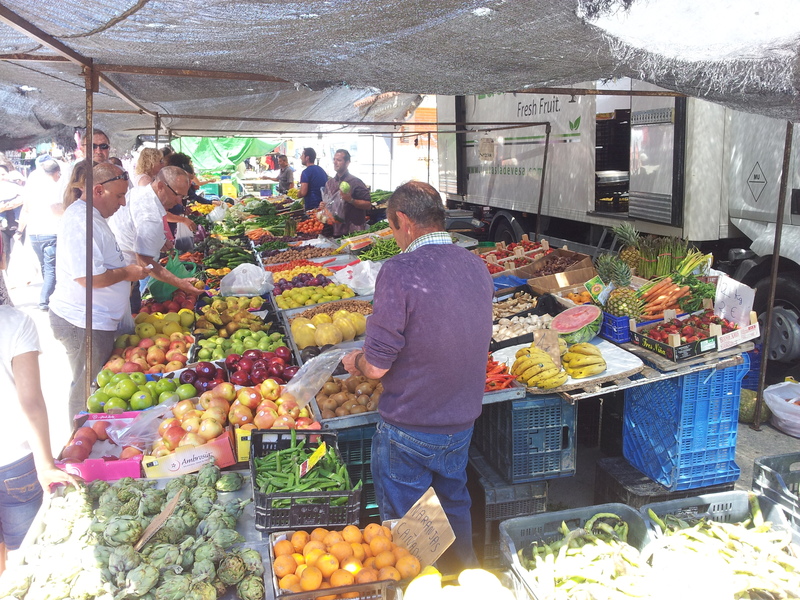 The markets of Turkey were always overflowing with beautiful produce. When we travel we generally prepare many of our meals, saves money and ensures we’re keeping this gloriously vegan and tasty. Everything seems to grow well in Turkey and Turkish people have a real passion for produce, they absolutely love their veggies, especially local favourites like aubergines and pomegranates. Here’s what The Guardian wrote about Istanbul’s markets, I always feel very at home in a food market, you generally see people enthused and passionate about food, it’s a revealing window into local culture. I also find many of the very freshest and most authentic restaurants and food vendors around markets. They’re the real deal, where the locals flock for delicacies. Lahmacun is normally made with minced beef and is served all over Turkey but we’ve packed loads of plant-based gorgeous-ness into our version and the flavour is epic. This is another recipe plucked from our recent cookbook ‘Peace & Parsnips’. You can eat it like a pizza or wrap it around some salad leaves, pickles, onions etc….either way, you’re in for a totally Turkish treat. I use shop bought ‘lazy’ flatbreads here, it would be awesome on your favourite home made flatbread of course. In Turkey, they may even be made in a blistering wood fired oven. One of our favourite ‘lokantasis’ (restaurants) in Istanbul, in a winding little alley close to Spice Market. Cheap and filling with loads of veggie options. Turkey really captured our hearts, from the vast expanses of emptiness in the heart of Turkey, the mountains of the East and of course, the glittering Mediterranean coastline. It is a truly fascinating place expressed perfectly by the diverse and rich cuisine. Pierce the aubergine many times with a fork, then put it on a baking tray with the red pepper and rub them both with olive oil. Bake in the oven – check the pepper after 15 minutes, then turn them both over with a spatula and bake for 15 minutes more. Take out the pepper and leave the aubergine in for another 10 minutes. They should both be soft and well coloured. Deseed the pepper, trim the aubergine, and roughly chop them both. While that is going on, on a medium-high heat, warm 1 tablespoon of oil in a frying pan. Add the onions and fry for 6–8 minutes, then add the garlic, mushrooms, spices, salt and pepper, and continue cooking for 3–4 minutes. Add a splash more oil if needed. Now add the red pepper and aubergine, with the basil and tomatoes, and warm through on a low simmer for 6–7 minutes more. Stir in the parsley, cover and keep warm. Your oven should still be rocking. Bring it back to 200°C/gas mark 6, lay out your flatbreads on baking trays and brush them with olive oil (especially the edges). 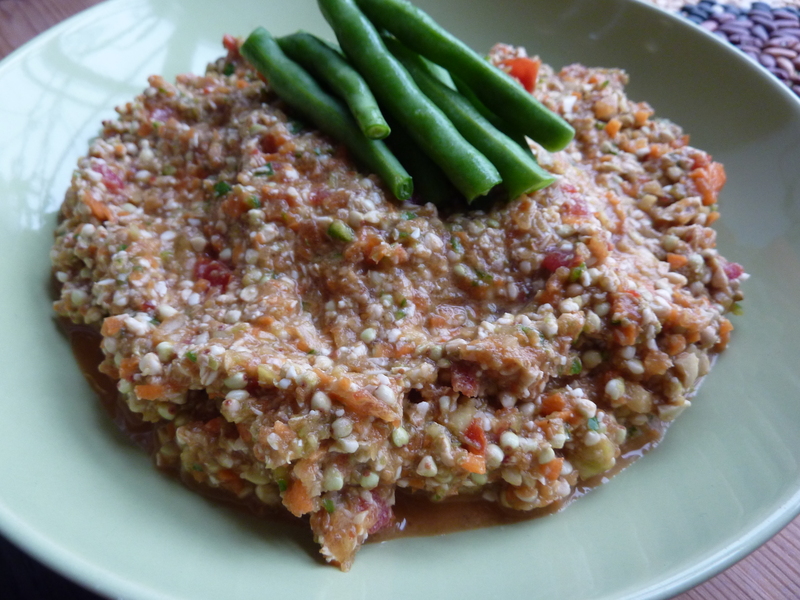 Spread the vegetable mixture thinly over the bread – 4 tablespoons per lachmacun is normally cool. Top with cashews and tofu feta (if you’re using it) and pop into the oven for 12–15 minutes. Drizzled with a little more olive oil and even a little squeeze of lemon juice. Depending on the size of the flatbread, this dish makes a great little or big plate and can be cut into wedges to be served as an appetizer or rolled around some salad. Raw cashew hummus (see page 160) is a perfect accompaniment. Aubergine (or eggplant, brinjal….) is a nightshade, along with tomatoes, potatoes and peppers. It has not always been appreciated as a delicious vegetable, for centuries in Europe it was a purely ornamental plant and was even said to cause insanity and leprosy if eaten! Aubergine is a good source of fibre and minerals, the skin is high in anti-oxidants and it is low in calories. We’ve had a real foodie time of it recently and this salad reflects that. Not only have I picked up some amazing produce at Ludlow and Beaumaris Food Festivals, but I have also been inspired by the chefs I’ve met. This is a salad that is caught between summer and autumn, quite apt in September. It’s also caught somewhere between a restaurant table and home kitchen. Do not fear, all of the these ingredients are easily interchangeable and there is only a few, quick, prep steps. This dish is a looker and is something you could serve at dinner party and it would go down a treat. Its full of bold flavours and the Aronia berry vinegar really lights things up. 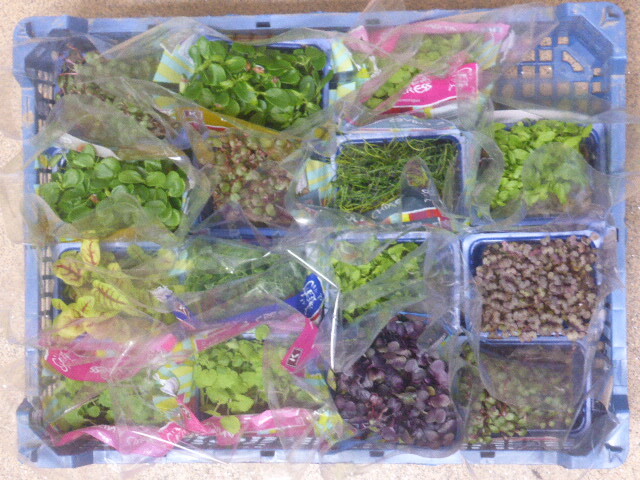 Like all salads, its a perfect way of expressing gorgeous produce. We have made these portions main course size, but you could easily scale things down and serve as a starter. I think this is the best way to cook beetroots. Although my mind does change often. I also love charring citrus. Aine Carlin reminded me how cool charring citrus can be with this simple and delicious dessert recipe ‘Cashew Cream and Griddled Oranges’. Check it out on youtube. Aine’s new cookbook is out soon, which is very exciting news. Basically its a hazelnut. This is the perfect time of year to pick them up and when they are fresh and young, they are plump and have a light, creamy taste and a texture similar to coconut. 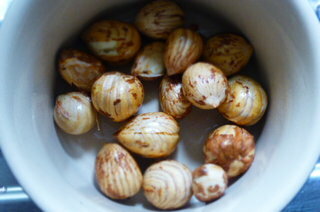 They are lighter than a hazelnut when roasted and something that is well worth a try. Cobnuts were only introduced to the UK in the 19 th century and they are famously from Kent. In this salad they bring crunch and richness. Use them as you would use a hazelnut. We met a lovely group of people at Beaumaris, Beri Da, who are growing Aronia berries in the next valley from us. Incredible to think that these things are happening so close and you miss them! We have tried a lot of food and nibbles over this weekend, but some really stand out. Beri Da is certainly one of them. Everything they produce is delicious and something a little different. Beri Da is a small family ran business and you can read more about their story here. Aronia berries are like blueberries but more intense and packed with even more antioxidants and good stuff. 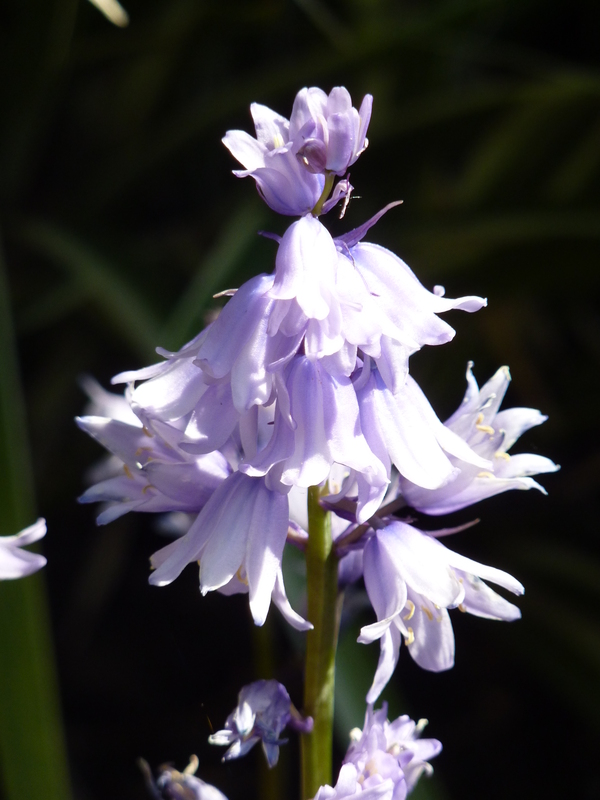 They are native to North America but are increasingly being grown in the UK. They are thriving near Mount Snowdon and the guys have just planted even more bushes at the base of the mountain. A very scenic place for superfoods to grow! The Aronia vinegar we bought is very intense, fruity and fragrant. A little goes a long way. We also have some chutney made with beetroot which is just too good to eat right now. We need to hide it away and dream about it for a while. Its fair to say that Aronia berries are going down well in the BHK. We are hoping to pop over and help with the next harvest, I’m not sure how many berries are going to make the basket! 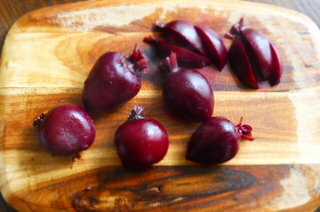 These beetroots were so good looking, I love that crazy, deep purple. I’m going to write more about the brilliant producers we met over the weekend in our next post. I’ll also let you know how our first cooking demo’s and book signings went at food festivals. We started at one of the biggest and surely one of the best, Ludlow. It was a blast! If you haven’t voted in Vegfest 2015’s massive vegan poll, tututututututututttttt! There are loads of vegan products, authors, suppliers etc to be voted for. You’ll find ‘Peace & Parsnips’ in the ‘Best Vegan Cookbook’ catergory along with a host of other excellent plant based cookbooks. The Vegfest is like the vegan Oscar’s and we’ll be down there doing a cooking demo. Is going to be HUGE! Exciting stuff. When frying the beetroots you can use any fruit vinegar, blueberry, raspberry, blackberry etc but all will be different. Some sweeter, some more potent. You just need to taste and adjust accordingly. For frying the beetroots you can also use balsamic vinegar and save your precious fruit vinegar for the dressing. If you chargrill the grapefruit for too long, they will begin to fall apart. Keep it to roughly a minute each side, we’re just looking for a few nice griddle marks to add a smokiness to the citrus flavours. Its well worth the little extra hassle. I have added avocado for a little bit of richness, but you could easily use cashew cheese or even well drained and marinated tofu. Our Aronia berry vinegar is very potent, you may need to add more fruit vinegar to balance the dressing nicely. It should be quite tart with good acidity and a nice twist of sweetness. The rapeseed oil we use here is good quality, single press, made like olive oil-type stuff. The flavour is sensational and we are loving Blodyn Aur or Bennett and Dunn. Both excellent and part of a new wave of quality rapeseed oil producers in the UK. This recipe makes just enough dressing. Double the quantity if you’d like extra to be served on the table. 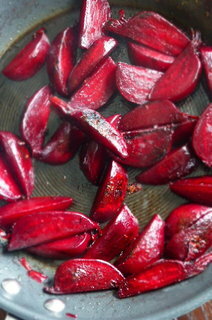 Nicely caramelised beetroots in Aronia berry vinegar – the smell was sensational! In a saucepan, cover the beetroots with water and add 1/2 teas salt, bring to a boil and lower to a simmer. Pop lid on and cook for 45 minutes. Remove the beetroots with a slotted spoon, keep the cooking broth to drink or use as a colourful stock. Pop the beets back in the pan and pop the lid back on. Make the dressing by whisking everything together (with a fork if you like) in a small bowl. Grab a griddle pan and very lightly oil, place on a high heat. When hot pop the grapefruit slices on. Leave to cook for a minute, they don’t take long. Flip them over using a thin spatula and cook for a minute on the other side. Now do the same with your cucumber slices. One minute each side. Set aside. Peel the skin off the beetroots (you may like to wear clean marigolds or other plastic gloves for this job). Using a teaspoon helps to bring the skin away from the beet. Cut the beetroots in half lengthways and then each half into four even pieces. Warm the oil in a frying pan and fry the beetroots for 10 minutes, turning them regularly. You should get some nice colour on them. Add the vinegar and toss the beetroots to cover with vinegar, this will help them caramelise nicely. Cook for 2 minutes and they’re ready to go. 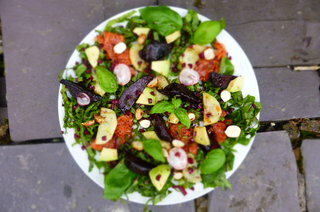 On large plates, scatter the leaves and top with grapefruit, cucumber, cobnuts, beetroots, avocado, sprinkle over the sliced beetroot roots, radish and basil, drizzle liberally with dressing. Best served when the beetroots are still warm. We had ours with some steamed whole grains (millet, green lentils and buckwheat) tossed in a little lemon juice and rapeseed oil. Nuts are good for you. Very good for you. Little nutritional powerhouses they are. Cobnut kernels contain 17% protein by dry weight, and about 15% fibre. Cobnuts are rich in vitamin E and calcium. They also contain vitamin B1 and B6. Not bad! These little fritters are bursting at the seams with flavours, and the herbaceous horseradish yoghurt tops things off very nicely. A punchy, zesty sauce is perfect with any fried food, lighting the palate up. The sweet earthiness of the beetroot and the fragrance of cumin were, very simply, made for each other. I like to use any green peas or beans for this, but the edamame probably have the edge due to their nice crunchy texture, which adds an almost nutty bite to the fritters. Use any flour you like, but I prefer to keep them gluten free. Gram (chickpea) flour would work well. Put the potato into a small pan, cover with water, add a pinch of salt and bring to the boil. Cook for 25 minutes, until soft. Drain in a colander, mash well and leave to cool. For the Horseradish & Dill Yoghurt, stir all the ingredients together in a small bowl. Season and drizzle with olive oil. This can be done well in advance. Once the potato has cooled to handling temperature, mix with the tofu, flour, mint leaves, lemon, salt and pepper. Now gently mix in the grated beetroot and peas, until all is well combined – using your hands is best. We’d like these fritters to be chunky and packed full of texture. In a large, heavy frying pan, dry-toast your cumin seeds on a medium-low heat for a minute. They should pop and give off a lovely aroma. Put them into a pestle and mortar and bash them up a little, then stir them into the fritter mix. In the same pan, warm ½ tablespoon of oil on a medium heat, ensuring that the base of the pan is evenly covered with a film of oil. Spoon in 2 heaped tablespoons of fritter mix per go, pressing it down a little with the back of the spoon until roughly 1cm thick. Cook for 3–4 minutes on one side and slightly less on the other. Repeat until you have a few fritters cooking at the same time, and continue to cook in batches. Drain on kitchen paper and keep them warm in a low oven. Warm and crispy on a bed of vibrant green watercress or spinach leaves, garnished with the spring onions and with the horseradish and dill yoghurt on the side. This recipe appeared on the Happy Foodie site where I’ve done an interview and there are several other Peace and Parsnips recipes over there. Peace and Parsnips has also been voted ‘Top Cookbook Debuts 2015’ and ‘Top 5 Vegetarian Cookbooks 2015’ We are super chuffed!!!!! Cooking is still a bit weird here after all of our raw escapades. We are still eating mainly raw, with a few exceptions, when the produce and mood take us in a hotter direction. I need to keep my hand in because of the work that I do. I’ve always loved a stuffed veg, Mum used to make stuffed peppers back in the dark ages on the early 90’s. Mum’s always been a bit of a maverick. I remember the first time she made cheesecake, in the mid 80’s with cheddar cheese! The family all came around to try this new found food. We’ve come a long way since then. This is a dish along the lines of the millions of other ‘stuffed’ dishes on cyber space, the only difference being, this is ours and its only semi-stuffed. Recipes that spring to mind via what you have at hand are always my favourite. Spur of the moment cooking, making the best of what you have. This recipe goes against all of the food combining advice that we have been following recently, but we felt like living dangerously! We are lucky to have brilliant courgettes at the moment from the farm and some sweet ripe peaches; combine that with a nut cabinet that never runs dry, mint growing wild like a madman in our garden and the ever-present cauliflower and you have the makings of a feast. I decided to add the cauliflower to the cous cous, I love the subtle flavour that cauliflower gives off when steamed/ boiled. It added great flavour to the cous cous. Being very much an amateur cook, I make many mistakes, or as I call them, great opportunities to learn. Cooking with an electric hob can be a real drag, but that is what we have. I much prefer gas stoves, mainly for controlling the heat by eye. When cooking the cous cous and cauliflower here, I forgot that the hob was still on very low and went off to do other things (drink tea), leaving the poor cous cous to overcook. Oh well, this is ‘real’ cooking and it still tasted good, if a little soft and congealed. The French beans here are optional and can be substituted with anything else green and is season. Peas, spinach, broad beans etc would be grand. We are an energy conscious household at the Beach House and don’t like turning on the oven unless very much necessary, namely, when we have lovely guests. Otherwise, it’s all hob. These courgettes could be blanched off in boiling water then thrown in a hot oven for a while, that would be nice. We have opted for the simpler and more efficient method of re-using your frying pan. This is an ideal seasonal summer lunch which oozes flavour. All that sweetness and crunch with the bitterness of the olives. You could even cook the courgettes on the barbecue if you fancy! Boil some water in a saucepan (follow quantities written on your cous cous packet, you will need a little less due to the water given off by the cauliflower) and stir in your stock, add your finely chopped cauliflower and cous cous, stir a little then tightly cover and leave off the heat to cook for 20 minutes. Fluff cous cous with a fork and re-cover until needed. If more water is needed, add now. 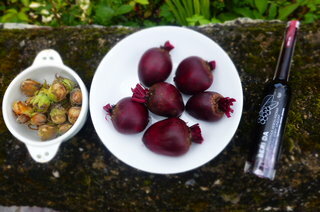 Heat your frying pan, add your hazelnuts and warm them through, lightly roasting them. Allow to cool, chop up into chunks. Then heat some oil in the pan, gently soften your onions for 5 minutes, until slightly golden; add carraway seeds and french beans. Cook for 5 minutes, stirring regularly, then add your mashed garlic, cook for 5 minutes more. Now add your mint, parsley and chopped hazelnut, stir for a minute to heat through, then add your cous cous and cauliflower, raisins, olives and peaches, with plenty of cracked pepper and some sea salt. Combine well. Be gentle with the cous cous here, you don’t want a mush! Cover pan and keep warm. In another large frying pan, heat some oil and on a low/med heat, fry your courgettes face down. Allow them to colour for a few minutes then flip over, repeat this twice and the they should be cooked. 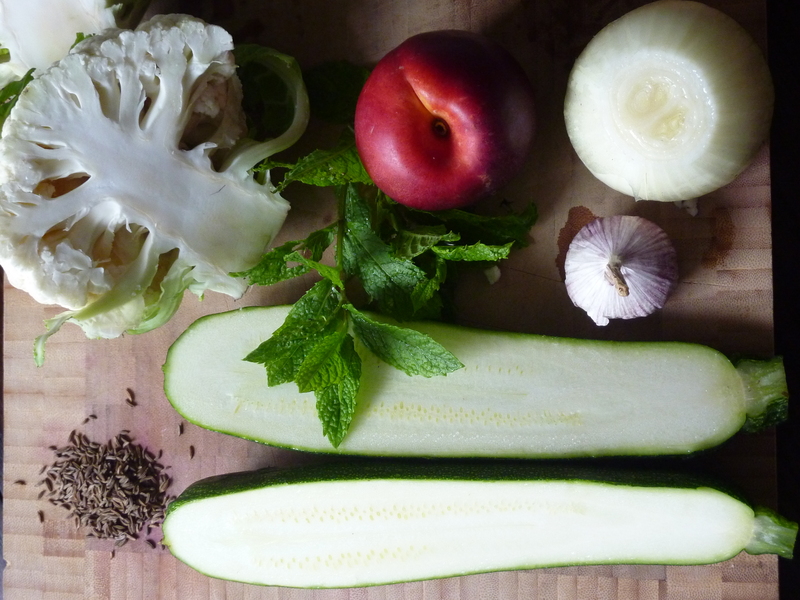 You don’t want to overcook the courgette, it should still have a little crunch in the middle. Place two courgettes on a plate, leave a little space inbetween, spoon over your filling. Pile it nice and high, finish with some of your chopped herbs. 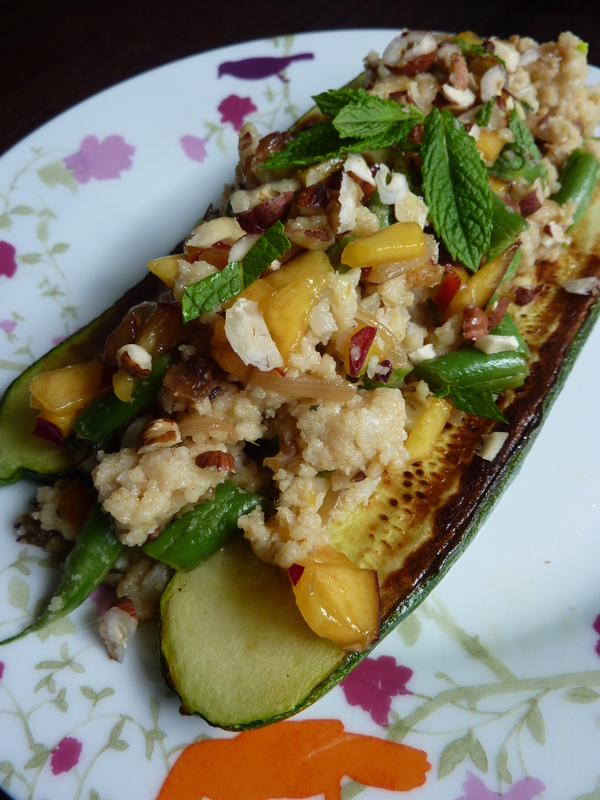 This is a great dish, ideal for a light summer dinner. The combination of flavours and textures here is something that delights the mouth (even with overcooked cous cous)! Cous cous is small balls of semolina flour, whole wheat cous cous is made with wholewheat flour and has higher nutritional properties. Wholewheat cous cous contains higher fibre and iron than the normal stuff, 1 cup gives you a third of your daily fibre requirement. We felt like a little starter, something to nibble on. Nibbles seem to be the new thing, judging by the snack section in our local supermarket. We seem to becoming a nation of rampant nibblers (dipped in hummus of course). Italians are the kings of the nibble, tied with the Spanish, but they tend to make it more of main meal, a la tapas. Antipasto (translated as ‘before the meal’) is always the perfect accompaniment to nice glass of chilled something and good conversation as the sun is beginning to settle down. This raw June (just passed) we have been mainly having large salads for dinner. We didn’t manage to arrange a dehydrator for the month, which would have meant many dried, crisp goodies. Instead we have normally opted for large bowls of salad, normally a green leaf based salad, a dip/ hummus/ raw cheese (something with a creamy texture), olives/nuts/pomegranate etc and one salad that is made of primarily harder fruit and veg (like this antipasto). All this served with a lovely dressing. 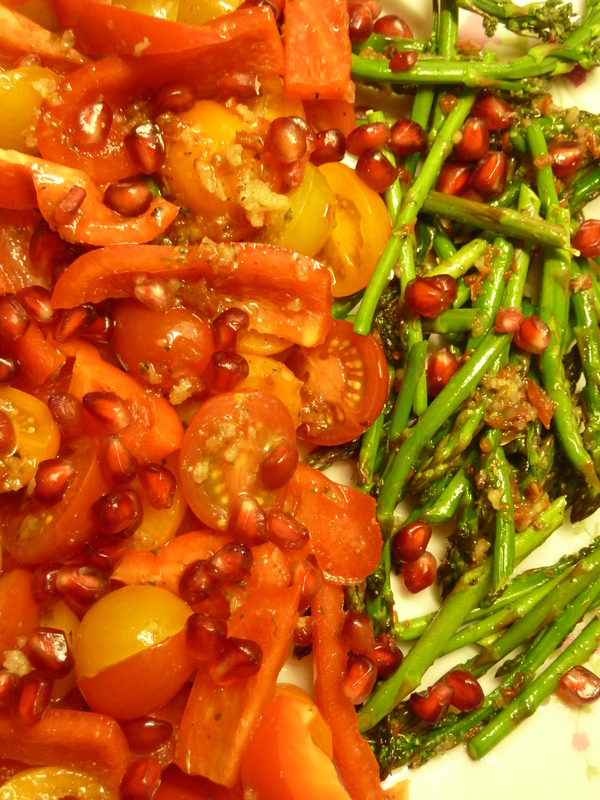 The combination of these salads is tantalising! We cannot get enough of them and have decided to extend raw June in the future……………our rawness may never cease!? This is a clean and citrus antipasto dish that boasts fresh, fresh flavours. The ideal pre-dinner plate to get the palate zinging. The combination of sweet pepper, tomato and pomegranate is a taste explosion that is difficult to match. If this little plate doesn’t liven up a dinner party, your friends may be comatosed! The asparagus here was the last of the season from our local farm shop and very much relished. It is not essential to the dish, but a real treat non-the-less. The subtle flavour and crunch of raw asparagus will be missed until it re-emerges next year. You can serve this with other antipasto favourites to make a platter, olives, artichoke hearts, chunks of cheese, marinated mushrooms etcetc. 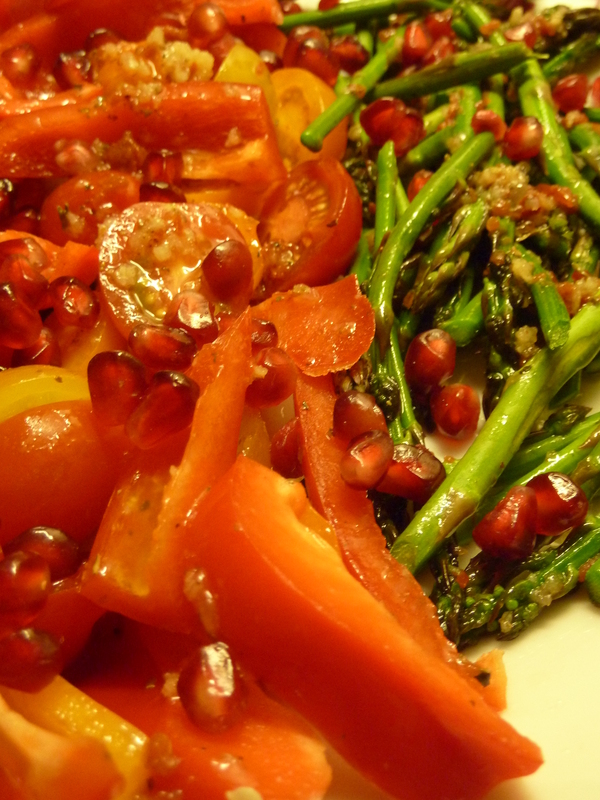 Organic peppers and tomatoes will make all of the difference to this dish and your salads in general. The organic veg flavour is infinitely better. Thanks to Mimi Kirk and the brilliant ‘Live Raw‘ book for inspiration here. If you live on a drab island like ours (where June resembles November) it is wonderful to leaf through the pages of this book and see the Holywood lifestyle and sunshine! 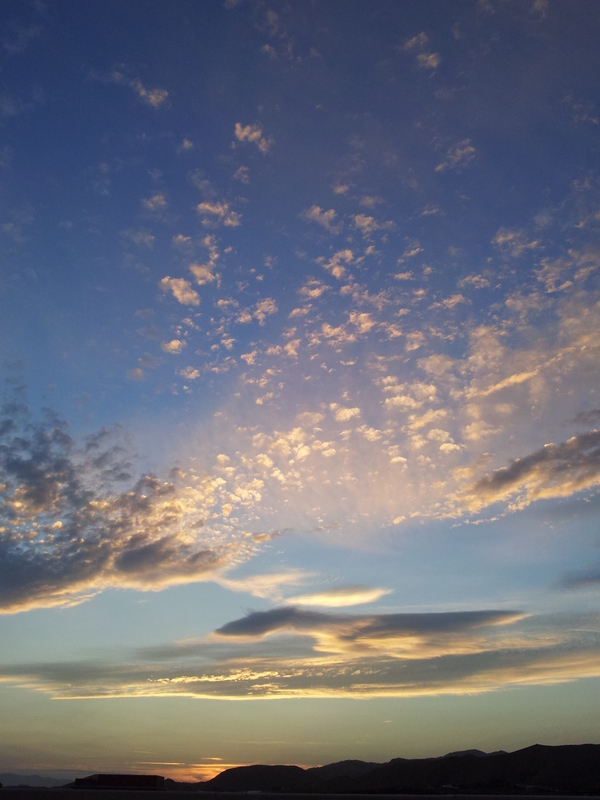 How I miss the sun. Marinade – 4 tbs good olive oil, handful of fresh basil leaves, 1-2 cloves of garlic (crushed), a pinch of marjoram, oregano, thyme, basil, juice of 1 small lemon, 2 teas capers, pinch of sea salt and cracked pepper. Whisk your marinade then combine all ingredients in a tupperware and mix together gently, don’t break up the asparagus and tomatoes. Make sure all is coated with the marinade. Leave in a fridge overnight or for at least a couple of hours to infuse. On a nice big serving platter with whatever accompaniments you prefer. You may like to add a little torn basil leaf as a topping and of course, some nice toasted ciabatta drizzled with olive oil if it takes your fancy. Most of us are aware that pomegranate is good for us. You can buy it in juice form all over Britain, it is most definitely a super fruit of note, packed full of the antioxidant punicalagin which scavenges free radicals from our bodies. Hooray! One of my favourite pomegranate products is the pomegranate concentrate, it adds an incredibly intense flavour to anything it touches. The worlds finest pomegranates are grown in southern Afghanistan, although I heard that Iraq had some tasty arils also! This may be the healthiest dish we have ever eaten. I can only see stew this doing wonderful things for us and it tastes amazing (always a bonus). I love the name ‘gigglebeans’, it’s is what Jane’s friend Alex calls chickpeas (or garbanzos, they have so many names!) What ever we choose to call them, they are fine legume and a welcome addition to raw June at the Beach House. We had tried previously to soak and sprout chickpeas. I don’t think we have the heat here. It has been a very strange season this year, our plants are not sure whether its winter or summer. I know the feeling! This may have affected the chickpea sprouts, as they don’t seem to like sprouting, they just swell up. After soaking the chicks for 12 hours, we have discovered that they are delicious, even without a sprout. It has been a revelation. Nothing adds bite and vitality to a salad like a crunchy chickpea, jam packed full of nutrition and protein, they are a real gift from nature. They are just like nuts, without the fats. I am always compelled to add the flavours of India or North Africa/Middle East to a chickpea. It just seems correct. I have restrained myself this time as I am having a few days detox before raw June ends. I feel quite amazing! I have never been a fan of the word detox, but I’m really enjoying it. I’ve dropped nuts and oils (fats in general) from what I eat and my energy levels have gone through the roof. You wouldn’t imagine that, but it is true. I went for a jog last night and I felt positively turbo charged. I’m not sure if it is wise as a long term diet, but who knows. I feel magic now. This raw stew came together from the idea for a dressing. It is definitely more of a stew, mainly due to the lack of leaves and the quantity of dressing. The dressing itself can be used on most vegetables and you can add some olive oil and salt, if you are not having fun experimenting with the raw things. In future I may add some fresh herbs to the dressing, a handful of mint of basil would be delicious. But as I said, I’m trying to restrain myself at the moment and keep things relatively simple for the palate. The combination of texture and colours here are a real feast for the senses, the flavours are light and understated, with the odd kick of chilli to liven things up. Using apple cider vinegar here adds a nice tang to the dish. Overall a salad fit for any table and certainly fit for any body. This will make a big bowl of salad, leftovers will get better in the fridge when left for a little marinate. Stew – 1 cup grated swede, 1/2 cup chopped mangetout, 1 sweet potato (chopped), 2 cups sprouted (swollen) chickpeas, 1 cup grated courgette. Cover the chickpeas well with water, they will swell up to more than double their original size. Leave for 12 hours then drain. You can eat them now if you like, if you would prefer them softer, add more water and leave for a further 12 hours. 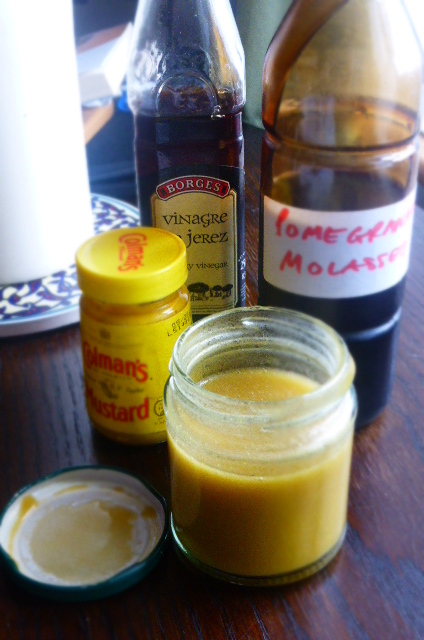 Dressing – Add all dressing ingredients to a food processor and blitz up well. Stew – Arrange/mix the salad and dressing in a big bowl. 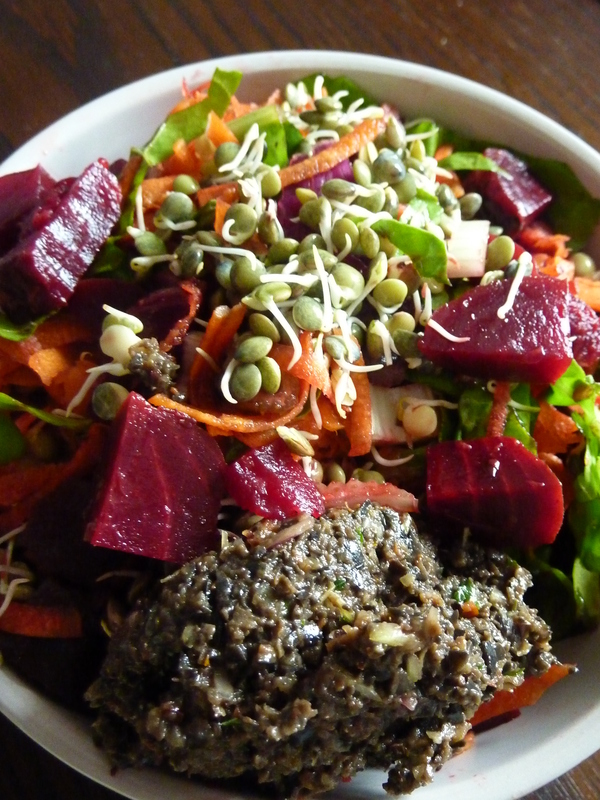 For the final, super healthy boost, top with a generous handful of sprouts (mung bean or green lentil would be great). After eating this salad, we felt our bellies sing! Such a vibrant thing and full of only goodness. The chickpeas really fill you up and you are left with a deeply sated feeling after this, no need for dessert or nibbles between meals. Chillis are originally from Central America and are such a mainstay of Mexican food. I remember eating raw chillis with my ‘Huevos Rancheros’ most mornings there. My body seemed to get used to their potent effects. Spanish and Portugese explorers (conquistadors) were originally responsible for making the chilli a hit on the world stage. Chillis are well reknowned for their medicinal and health benefits. Chillis contain an impressive number of plant based compounds that help to prevent disease and promote health. The spice in chilli, a compound named capsaicin, is a powerful anti-bacterial, anti-diabetic and lowers cholesterol levels. Chillis are also rich in vitamin C, A and Beta-carotene, these help us counter the effects of free radicals created when the body is under stress or disease. Chilli heat is measured by ‘Scotville Heat Units’. Your average sweet pepper will get a 0, tabasco sauce rates at 2,ooo-5,000, a mexican habanero weighs in at 200,000-500,00, but the hottest chilli in the world is the Naga Bhut Jolokia (or Ghost Pepper) rating at a whopping 1,041,427. Not surprisingly, the NBJ has been used in manufacturing weapons, being placed in hand grenades and pepper spray! Tapenade is one of those things that we don’t eat enough of. Everytime we have it, we say the same thing, “Why are we not eating more tapenade!” It is delicious and is one of those classic summer dishes that reminds me of holidays in Greece and France. I ate alot of tapenade at break times whilst picking grapes in Beaujolais. We’d have it spread over warm baguettes, with local cheese and lashings of whatever wine was in the bucket (purely medicinal, it helped to dull the back pain you see). I believe that the intense satisfaction I got from munching the tapenade pulled me through those back breaking times. The wine was certainly nothing to get excited about, unfortunately. This is a wonderful concoction of flavours that I’ve had a little play with (of course) and omitted the use of capers due to a forgetful moment at the shops. The unique caper-ness has been replaced by the gorgeous sun-dried tomato. Not a bad substitute! I have also added raisins to add a little sweetness, the black olives can be a little bitter in these parts, Wales not being high on the olive producing charts. The rest is fairly classic tapenade, forming a delectable black paste that can be spread or dipped as you choose. I love this type of food, which is greater than the sum of its bits. I normally think of Tapenade as being a Greek dish, but it actually hales from Provencal in France. Traditionally this puree contains caper, anchovies, black olives and olive oil. The French would normally serve it as an hors d’oeurve or stuff it into a steak. Tapenade is alot like pesto (see our ‘Hazelnut Pesto‘ post) in that it is a joy to behold sitting in the fridge door. It just hangs around and marinates, getting better and better. It goes well in so many things and mixed with some oil, makes for an instant wonder dressing. The best part is that it has a gourmet flavour with very little needed in way of preparation. The way you chop up your veg has a major effect on the presentation and texture of a salad. Have a little think before you begin to chop about what type of effect you’d like to create. If you spend a little more on good quality olives here, it is well worth it. The black variety are normally a little cheaper and in their own way, just as good as some of their greener brothers and sisters. 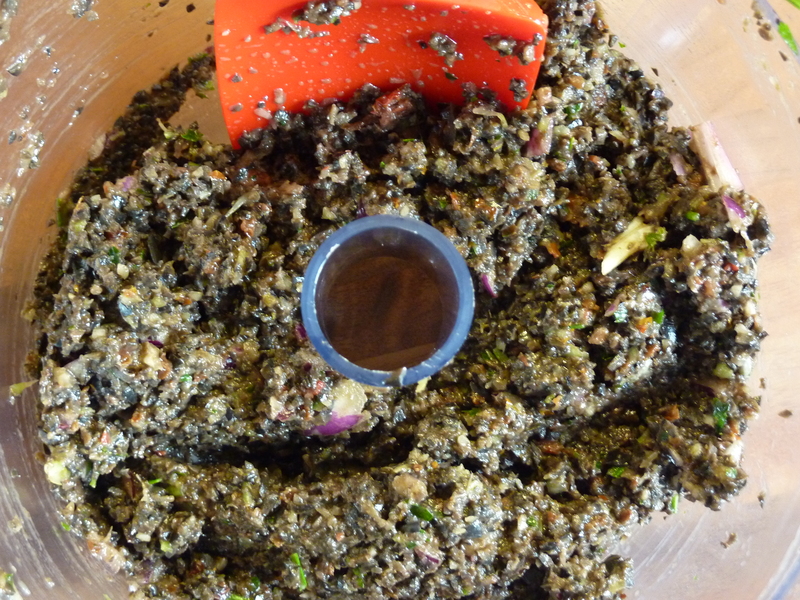 Black Olive Tapenade in the mix…..
Tapenade – Add all ingredients to a food processor and begin to whizz. As it becomes sticky, trickle in some remaining olive oil to create a beautiful, shiny puree. Keep in a sealed container in the fridge overnight for maximum marination (new word for you there!). 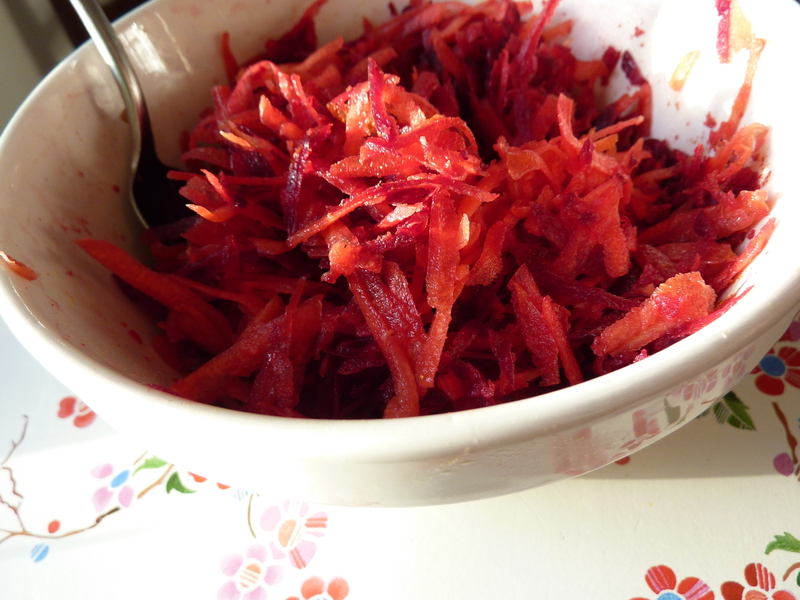 Salad – We put the red onion and carrot into a food processor and grated, then chopped the celery, spinach and beetroot separately. Thin out some tapenade by adding the same quantity of good olive oil and whisking well. You can lower the amount of tapenade if you’d prefer a lighter dressing. Pour the dressing over the salad and give a good mix in. Place in your favourite salad bowl and top with a handful of green lentil sprouts (see our ‘sprout‘ post for how to sprout your own, its quite simple). Then spoon on some tapenade. We have also used it to flavour soups and stews and of course in post June days we’d have it lathered on some warm oat bread. This tapenade has a great balance of bitter and sweet, with the beautiful silky texture of pureed olives. Olives are one of the oldest foods known, dating back 7,000 years. Black Olives are left to ripen for longer on the trees, green ones are picked earlier, they generally have a milder flavour. Olives are a good source of iron (which helps to carry oxegen in our blood) and are low in calories with plenty of good fats. They do however contain a decent amount of sodium and should be eaten in moderation if you’re keeping an eye on salt intake. Twelve black olives provide 1.8mg of iron. Interestingly women need 18mg of iron per day and men only 8mg. This is not exactly Asian, not your average back street Shanghai fare; we lack some ingredients but do our best in the hills of Wales! This recipe boasts all the flavours you would expect from a classic Asian dish, with the raw touch of sprouting buckwheat and the richness of cashews. It really is a revelation that this food tastes so good cold and is so satisfying. Who knew? We live quite remote, the nearest decent shop being 30 mins drive. For a cramped island like ours, 30 mins is quite a distance. If you can believe it, there are no fresh fruit and veg markets in the entire area. It is strange, we are quite unique. We therefore use what we have locally, there is a shed over the hill that sells the occasional organic vegetable, at this time of year, local produce for sale is quite sparse. Hence we make do and blend! We have been missing our Thai curries, stir fries etc, so this was my attempt at adding a new set of flavours to this Beach House raw June. I like adding cucumber to dishes, it freshens and lifts things. These recipes are known as ‘living food’ due to the sprouting going on. Anything sprouting is full of life and nutrients and is serious super fuel for your body (and mind/well-being…..). 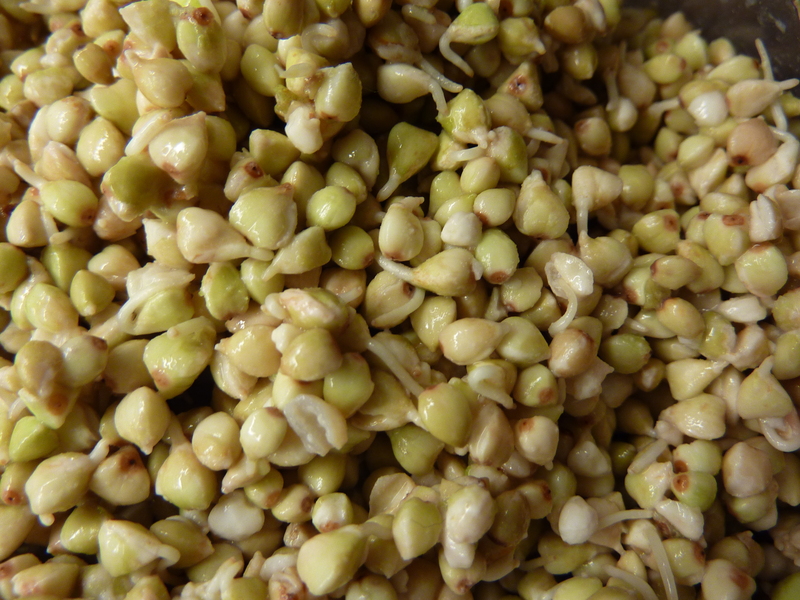 Sprouting buckwheat has a lovely bite to it and reminds me of a fuller quinoa in flavour. It tastes and looks like a grain, but is gluten and wheat free. It can also be blended up into a lovely porridge (more of this to come). Buckwheat sprouts well and only takes a couple of days. The technique is simple enough, soak for 24 hours in fresh water, drain and wash, leave for 24 hours, drain and wash etc. Until sprouts begin to appear. It is then ready to eat. This stew has a lovely rich feel and is very satisfying, which you need on the grey island (Britain) were it is currently summer/winter in just one day. The storms may rage outside, yet we are warm inside and dreaming of the East…. 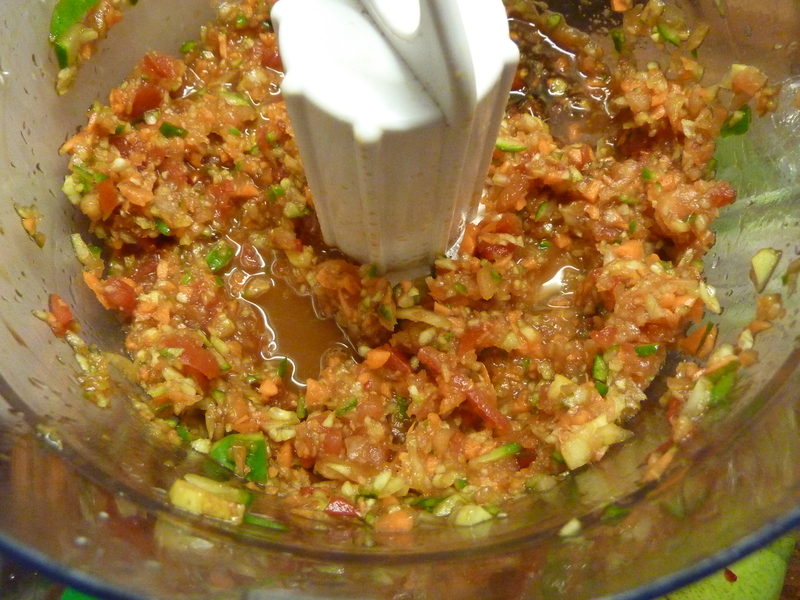 Add all veg and sauce bits to the blender blend to a fine salsa like mix, taste check for balance of flavours, then add your stew bits and pulse a few times to break up the buckwheat and cashews slightly. Not too much, you need a little bite there. 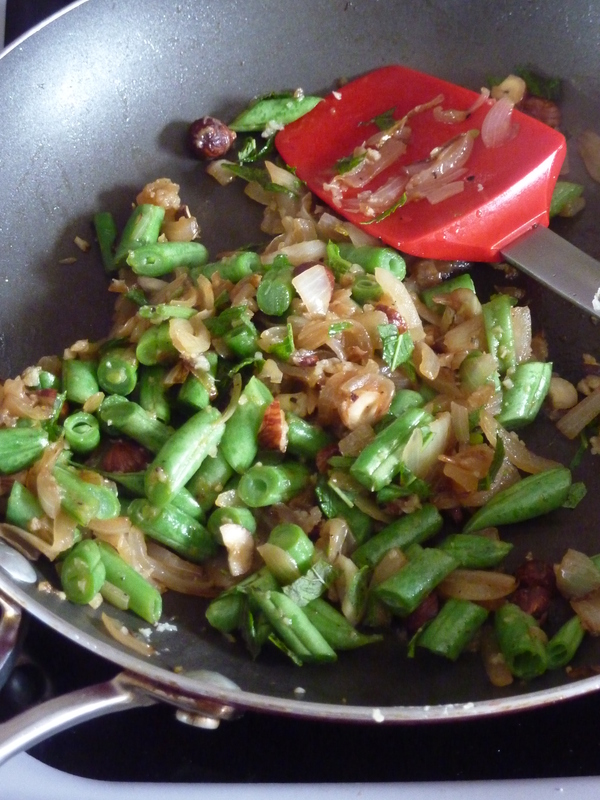 Chop up your greenbeans and scatter on top in any fashion that takes your fancy (we normally mix half into the stew). Finish with a few sprinkles of sesame seeds (we were out of stock here) and some broken cashews. This beats a sloppy Chinese takeaway any day of the week! 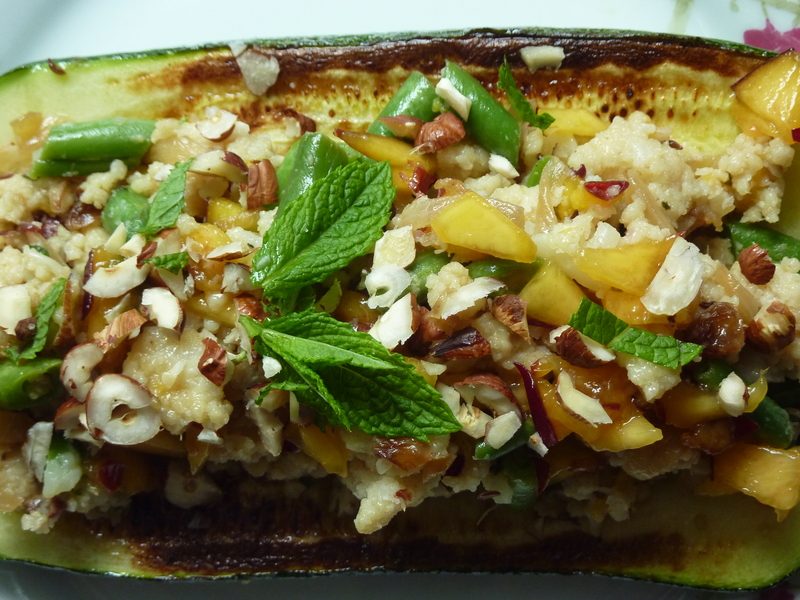 Bursting with vitality and nutrients, this is one of our favourite raw recipes thus far. Buckwheat is one of the most complete grains globally and contains all eight essential amino acids (meaning you can basically live on it!). It is great for diabetics as an alternative to sugary wheat and also alkalizes the blood. Buckwheat even boosts the brain, it contains high levels of lecthin and 28% of the brain is made of lecthin which also purifies the blood and actually soaks up bad cholesterol. Wonder food! 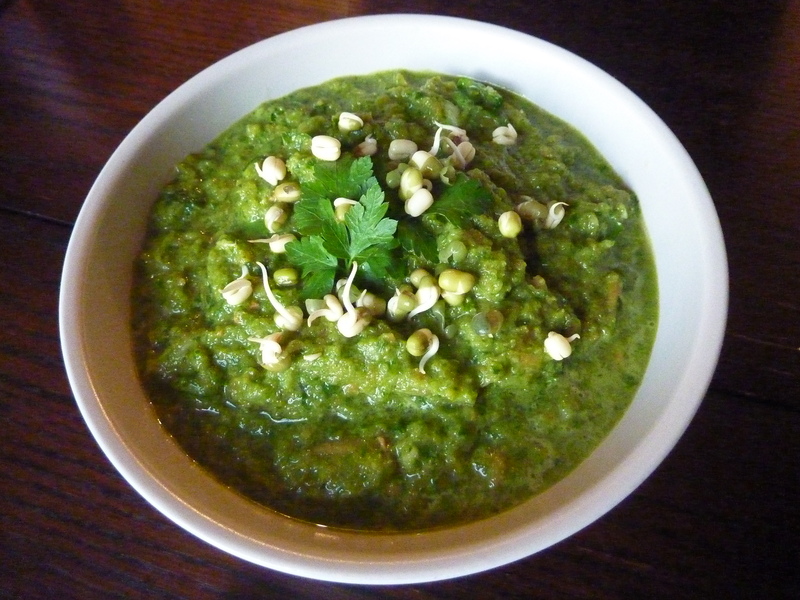 A creamy raw soup that is deep green and delicious. This is raw food at its finest, a lovely texture and flavour and also packed full of nutrients. It is thick and filling. This is the perfect soup for a nice lunch in the summer garden. No emeralds are used in this recipe! This soup is so vividly green it must be good for you. Savannah and Jane made this one last night and they both commented on how easy it is to prepare. It’s funny in raw food that the ingredients list normally outweighs the preparation list. It’s quick. There is also less washing up to do! Raw food is dense in nutrients and I am eating less for meals. One bowl of this and I was well sated. The inspiration for this soup came from the brilliant raw food book ‘Eat Smart, Eat Raw’ by Kate Wood. It is written specifically for raw fooders in the UK. It is fast becoming our raw food recipe bible. All vegetables here are grated beforehand to make it easier to blend. 4/5 carrots, two large handful of spinach, 1/2 onion, 2 cloves of garlic, 1/2 apple, 1/2 avocado, 1/2 tbs miso paste, 1 tbs flax seed oil (we used rapeseed oil), 1 teas dried seaweed, 300ml water. All goes into the blender and puree until smooth. Mix mung bean sprouts in and scatter on top with some freshly chopped parsley and I added a scattering of sunflower seeds. Spinach is full of iron: two out of every three women in the UK are iron deficient. This one has floated all the way over from New Zealand. That’s a long way for a recipe to float. Big hugs and thanks to my ace mate Ang for this one. 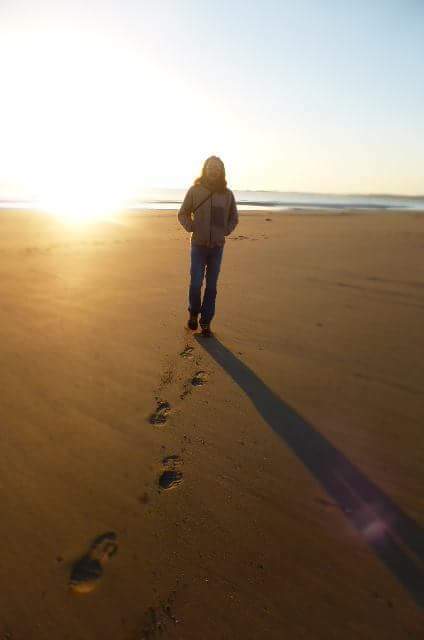 Ang was a resident of Barcelona, but has recently left Catalonia for her native island, New Zealand. In our topsy-turvy world of hopping around the place, I haven’t seen Ang in way to long, this salad reminds me of the amazing healthy food (and warm cookies) that she used to whip up in Spain when I visited. This is exactly what we are looking forward to eating this month of raw-ness. I make this to take to parties or picnics but always leave a portion at home because it’s even better the next day. Vegetarian Cookbook’ by Murdoch books ISBN 0-86411-510-5 in which you also use chopped roma tomatoes, black beans, corriander and rocket. Do you have a raw recipe we could try? This is our version of the famous Waldorf Hotel breakfast dish. It was originally created by a man named Benedict (surprisingly!) who wanted something to cure his hangover. I have almost completely changed the dish, made it a healthier delight, and served it for supper. That seems to be the BHK style, take a classic and meddle with it until it is almost unrecognisable! Asparagus is a very beautiful thing, so fleeting, which makes you appreciate it more. I have recently looked into growing them and it really is a labour of love. They are quite tricky and only give you good spears after a few years. Hootons Homegrown have been selling some delicious packs of asparagus, so we’ve been using it in many recipes. Simply pan-fried is my favourite and topped with a local egg makes it something rather special. This is a gorgeous light dinner or lunch and quick to prepare. The layered effect and combination of creamy dressing, runny egg and crispy vegetables give it a ‘complete’ restaurant dish feel. We added a little toasted oat bread for some ‘packing’. We’ve been in the garden for most of the day, doing loads of seeding and planting; transplanting and spreading of horse manure. We needed a good feed. We loved to use the last of our wild garlic here, picked from the roadsides of Anglesey. The extent of our foraging consisted of opening the car door and leaning out. Not exactly Ray Mears, but just as satisfying. Who doesn’t appreciate a little free food? Glug of olive oil, half a handful of pumpkin seeds, 1 big handful chopped wild garlic, 1 big handful chopped mint, half a large head of broccoli, 5 handfuls of spinach leaves, 1 large handful cherry tomatoes, splash of water. 1 teas honey, 1 teas dijon mustard, 4 teas olive oil, 1 teas white wine vinegar, salt + pepper (s+p), 4 teas creamy natural yoghurt. Make dressing, add all ingredients to a small bowl and mix together thoroughly. Taste and adjust to how you like it (sweeter, saltier, not quite mustardy enough, more bite, smoother etc). 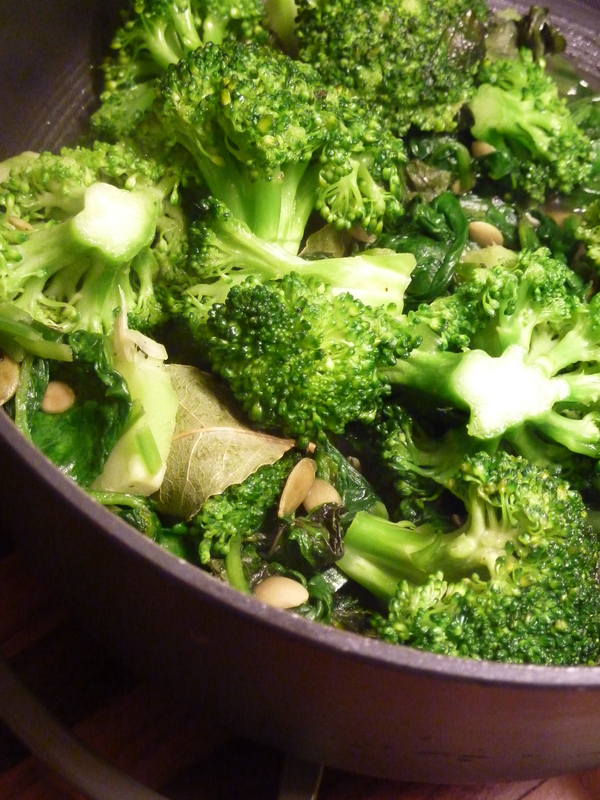 In a large saucepan, on a medium heat warm the olive oil then add your pumpkin seeds, roast for a few minutes until slightly golden, then add the cherry tomatoes and scorch a little, then add the wild garlic then broccoli. Add a splash of water (roughly 2 tbs). Season with s+p. Cook for a couple of minutes then add spinach and mint. Put to the side with the lid on, keeping warm. This will steam the broccoli. In a separate small saucepan, bring some salted water to the boil with a splash of white wine vinegar and poach your eggs (crack them into a tea cup and pour low and gentle into boiling water for a neater shape). As that is happening, heat a glug of olive oil in a small frying pan and flash fry the asparagus spears for three minutes. Do not overcook, they should be nice and crunchy. You may add a splash of truffle oil here, if you are feeding people you love very dearly. It’s a decadent touch. Give your salad leaves a quick wash and drain. 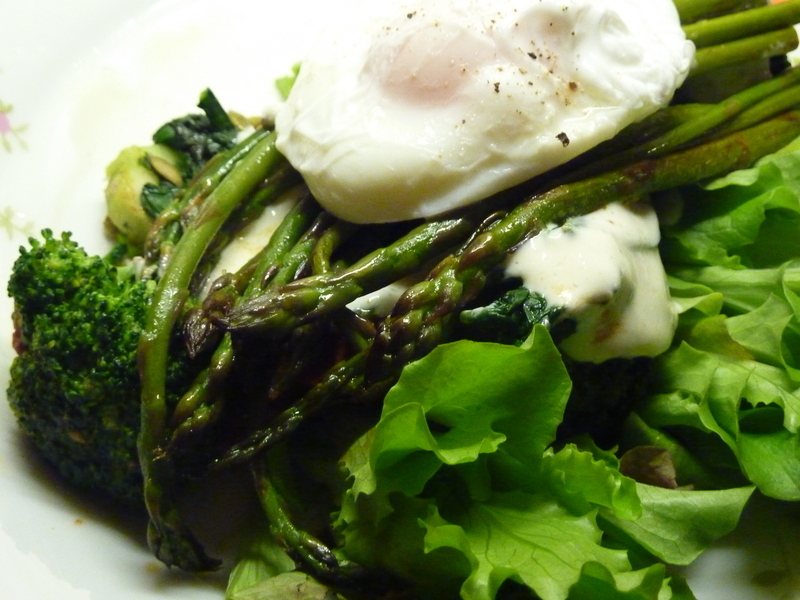 Place a flat pile of green salad on your serving plate, add the broccoli and wild garlic fricassee (posh word for something fried), then spoon over the dressing, top with a neat pile of asparagus spears and place the egg on top and season with a little s+p. We had it with a piece of toasted oat bread. Jane loved it so much she actually licked the plate clean! It wasn’t pretty! Asparagus has been enjoyed by folk for thousands of years and has also been used for its medicinal properties. Asaparagus is brilliant for digestion and helps to regulate our blood sugar levels. It also contains very high levels of Vitamin K.
The food we cook reflects our journey through life. It’s been a long old dusty road with some tasty nibbles along the way. Much of my inspiration for recipes and greater experiences in general have taken place away from the shores of my island home, Britain. 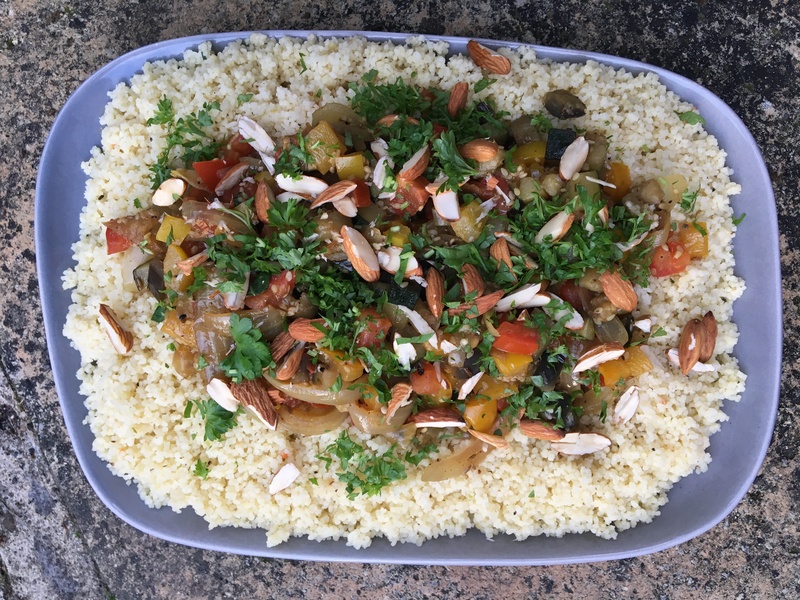 It is a grey Sunday today, in need of some sun and spice, so I re-visited Morocco for a classic(ish) tagine and pilaff meal. I probably ate this alot when I was there, but due to the fog of time and the sheer influx of brilliant tagine in the streets of Marrakech (‘Kech) and beyond, I forget. One tasty tagine seemed to blend into another, until you have a very long tagine spell which many people would just call ‘travelling around Morocco’. Find out more about our passion for tagine pots here. 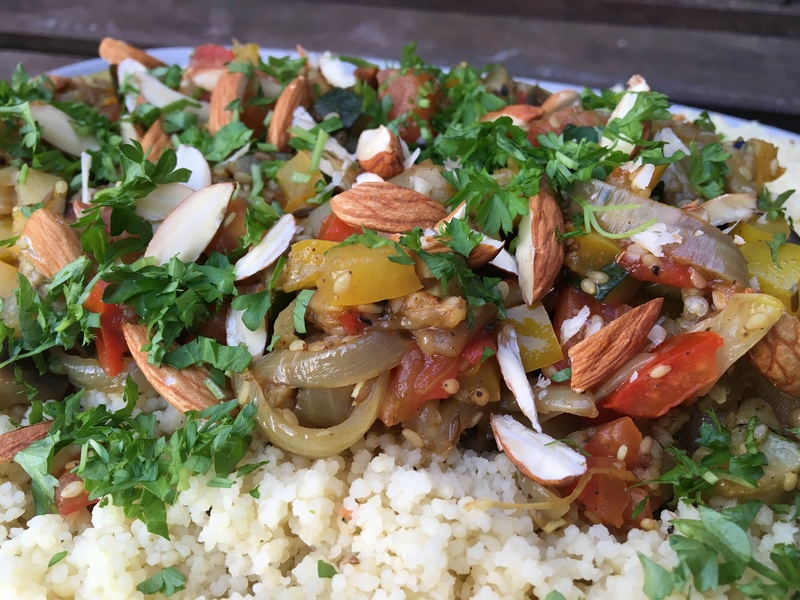 We love the combination of spices and dates, there is bags of harmony in this dish with the lovely flavours of coriander and mint to finish things off. You may use tinned tomatoes, but we prefer fresh. The orange is an addition that is not normally used in Morocco, but we’re a long way from Marrakech! 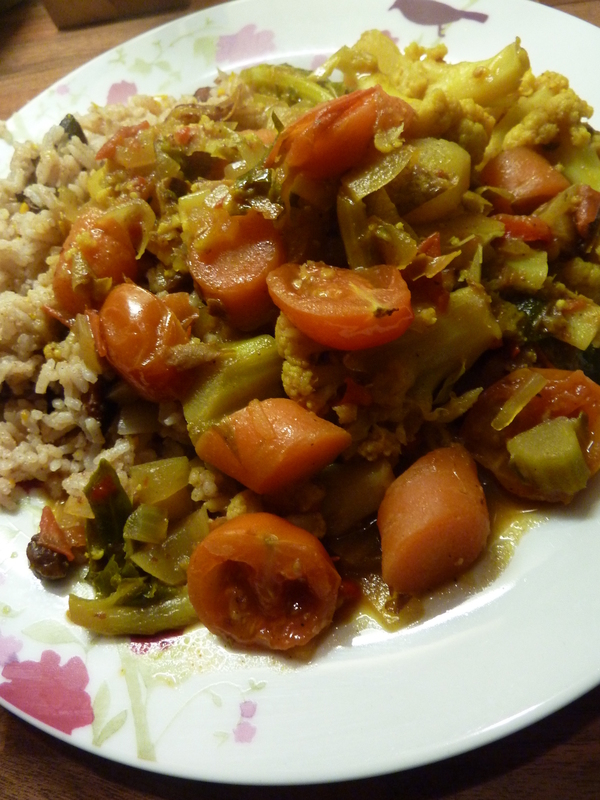 1 large cauliflower (leaves and all), 4 carrots, 1 big handful of stoned dates, 1 potato (for thickening sauce), 4 ripe tomatoes (chopped into small chunks, or 1 can of good organic toms), 1 ras el hanout (if you can’t get hold of this, I suggest a mix of your favourite spices. That’s all it is really), 1 teas turmeric, 1/2 teas chilli powder (be careful here! ), 1/2 teas coriander seeds, 2 teas chopped ginger, glug EVOO (E.xtraV.irginO.live Oil), 1 onion (chopped), 3 cloves garlic (chopped), 1 handful of chopped coriander and 1 of chopped mint, 750 ml (a wine bottle size) of good veg stock, juice of 1 orange, s + p to taste. Glug of EVO, 1 onion (chopped) handful of roasted almonds, 1/2 handful of currants, 1 teas ground cinnamon, 350g long grain rice (we normally prefer brown rice, tastier and better for your belly), zest 1 orange. 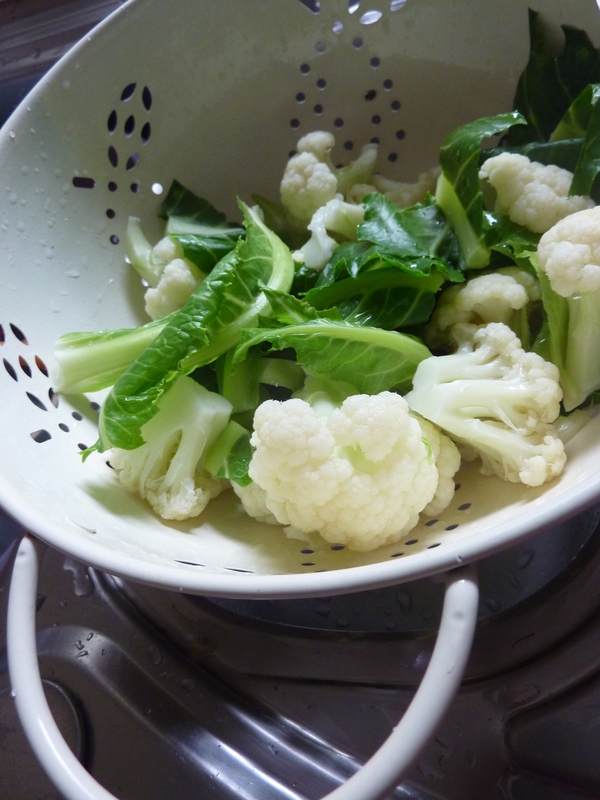 In a large pan, blanch your potato, cauliflower (use the leaves as well, they are very tasty) and carrots. Add potato first for 5 mins then add the rest for 2 mins. Drain the veg well and refresh with cold water. Place in a bowl and add spices and ginger, stir, leave covered for a couple of hours to infuse and get yummy. Save the water for stock, approx 1.5 litre needed for the rice and tagine. Just add an onion, a stick of celery, a carrot, some good stock powder, a bay leaf and some mixed herbs and slowly boil for 30 mins. Strain out all bits and thats it. A light veg stock. Heat oil in a good heavy-based pan and gently fry you blanched veg for 5 mins, they should be getting nice and golden, then add onion and garlic and cook for another few minutes, add tomatoes dates and veg stock and simmer for 20 mins on low heat. Season here, add orange juice and stir in the coriander and mint. Do not over cook the veggies, they are not so good mushy. For the Pilaff, heat oil in a pan and cook almonds for 5 mins then remove when golden. In the same oil add the onion and currants cook for 2 mins, add cinnamon then rice and coat all in all. Then pour over hot stock, cover tightly and cook for around 15 mins (depends on rice, remember no lifting the lid! Keep all that good steam in). Remove from heat and cool for 5 mins. Stir and lift with a fork before serving to seperate the rice and make it fluffy. 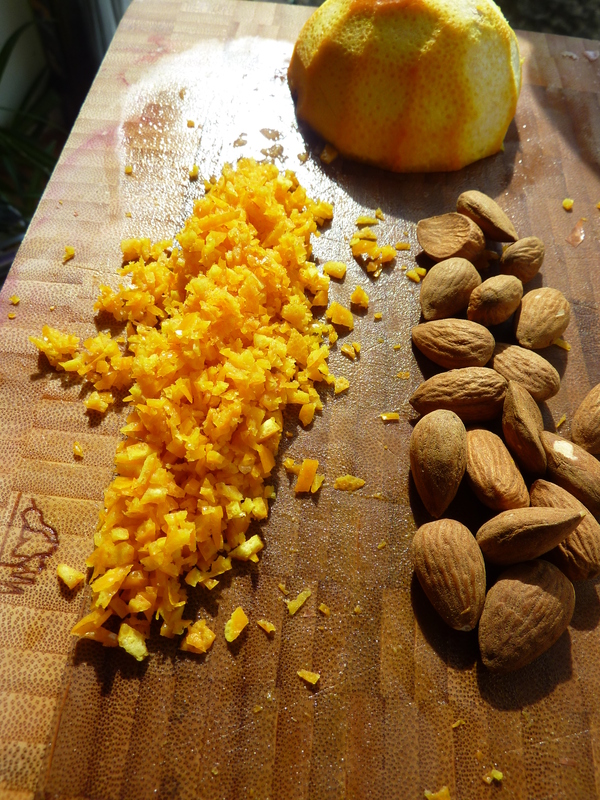 Finally, add the orange zest and almonds to the rice, stir again and serve with your tagine on your finest, colourful, platter (or just a plate). Cauliflowers just don’t get the credit they deserve. They are full of good stuff. Cauliflowers are full of vitamin C and manganese and a broad spectrum of anti-oxidants that give your system a real boost. It’s also anti-inflammatory, aids digestion (plenty of fibre here, like most of the cruciferous bunch i.e Kale, Brocolli etc). 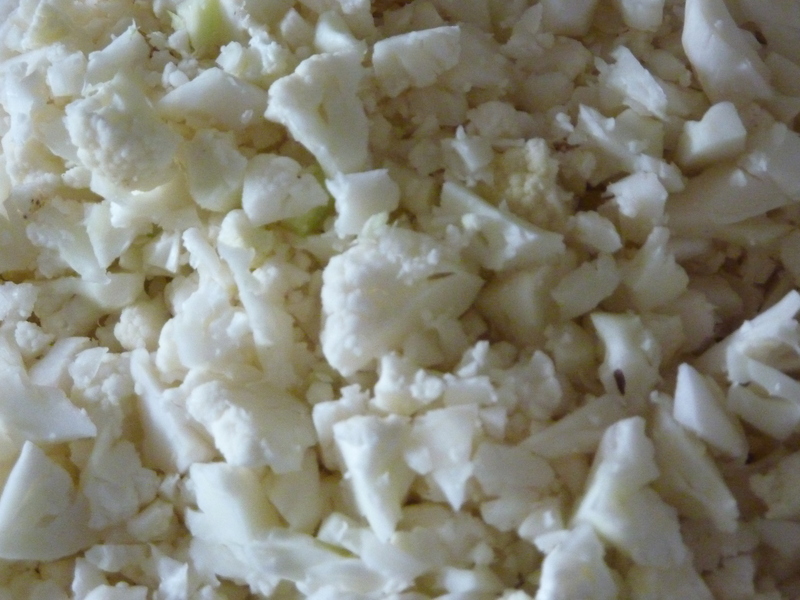 The coarse green leaves, which we love to munch on, protect the centre of the cauliflower, reducing the chlorophyll and making it white. This is not booze actually, but we had some chilled Clipper Tea with this. The ‘Green Tea with Echinecea’ variety, in a tall glass with plenty of ice, lemon and a dollop of honey. You could very easily add booze to this, I’m thinking vodka or maybe gin would be pleasant. Today the sky is the deepest of greys, the washing nearly blew away and Jane poured a pint of water all over her computer. We both held the stricken machine in our hands, then noticed the water pouring out of the side with the plug still in the wall…the penny dropped…we placed it in-front of the fire and thanked our lucky stars for not getting frazzled. We put on some Vashti Bunyan and started to make lunch………. Out of this peaceful state came this wonderful combination of vibrant colours and flavours. The salad is an old friend from past summer days, the beetroot, carrot and orange is a tantalising combination and packed full of good things. Preparation could not be easier, this is a real raw food delight. The tea is fairly straightforward also! From a potential near-death experience, to a rainbow lunch and ‘Rosehip November’ (in April). Happy days at the Beach House. 1 large beetroot, 1 large carrot, 1 large chunk of butternut squash (optional, just increase the carrot by one), juice of half an orange, handful of chopped coriander. Grate all veggies, we used a hand grater, or plug-in your food processor. I appreciated the exercise actually. I peeled the beetroot and the squash. Squeeze in the OJ and throw in the greenery. Add the finely chopped pith of the orange for even more of a citrus POW! Mix up and leave at room temp for a while, let the flavours mingle a little. We made a lunch out of it with some toasted leek oatbread (recipe soon to appear on the blog) and cucumber raita. This is a versatile ‘slaw that will brighten up any plate. 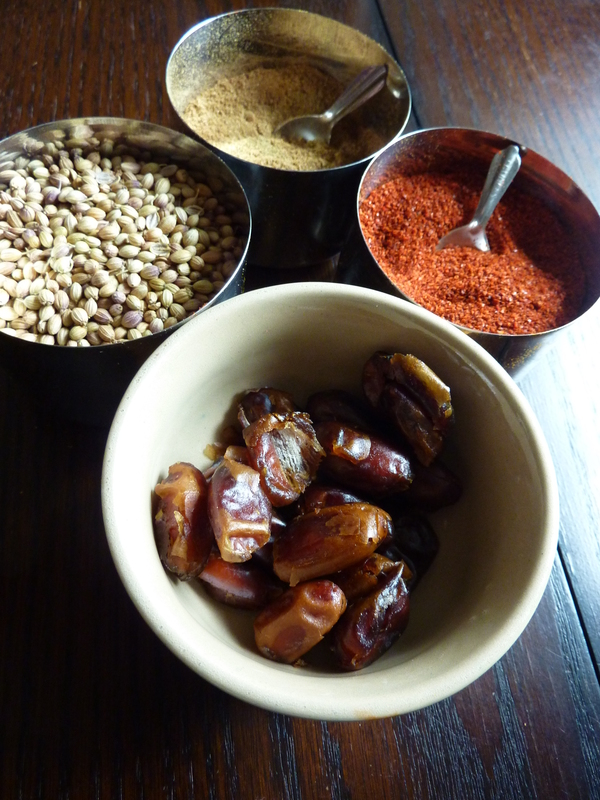 We spiced it up with a couple of pinches of Ras El- Hanout spice and a splash of olive oil. 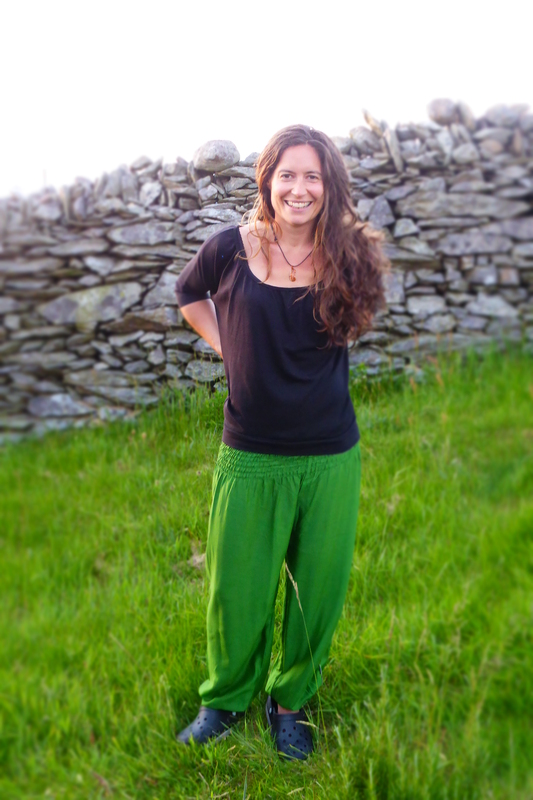 Our raw life starts in June, why not live dangerously for a while! It’s a Clipper Tea. An organically grown infusion, fruity, with a deep colour and plenty of vitamin C. The good people of Clipper are in all of our supermarkets in the UK and always good value. They use unbleached bags and have an awesome range. Their black tea is a winner with a splash of soya milk (and lashings of honey, B.H.K style). We have also tried the tasty Dandelion and Burdock Tea, which took us back to our childhood days, drinking the fizzy sweet version out of glass bottles in bracken, near streams. Rose hip has been used for years for its health properties, the fruit of the Rose is especially good for the joints. The Vikings used it on long sea voyages to ward off scurvy, its packed with Vitamin C. It also contains most of the B vitamins and the mighty vitamin K, with antioxidants and rich fatty acids surely making this a real superfood.